Basic problems concerning the computer simulation of liquid metals in usual and extreme conditions with the use of interparticle potentials, mainly multi-particle potentials of the embedded atom model are considered in the book. The general questions of a structure of simple liquids, and the methods of simulation of non-crystalline systems (liquid and amorphous) – a method of molecular dynamics, Monte Carlo, quantum-mechanical modeling, etc. – are considered in the first five chapters. The types of interparticle potentials applied, the analysis of atomistic models, topological characteristics of liquids, and the results of modeling one-component and binary systems with the use of the simplest interparticle potentials are considered. In the second part of the book, a specification of interparticle interaction is given for 17 metals of the various groups of the periodic system with the use of the embedded atom model. Parameters of potentials under ambient pressure are found using the experimental data about properties of metal on the binodal, and for strongly compressed states via the metal properties found in Hugoniot adiabatic processes. The role of electronic terms in energy is considered in detail. Tables of the potentials are given in the Appendix. Then, thermodynamic, structural and diffusion properties of these metals in wide intervals of the pressure and temperatures are calculated (usually to hundreds of GPa and tens of thousands of Kelvin). The results of the calculations are tabulated. 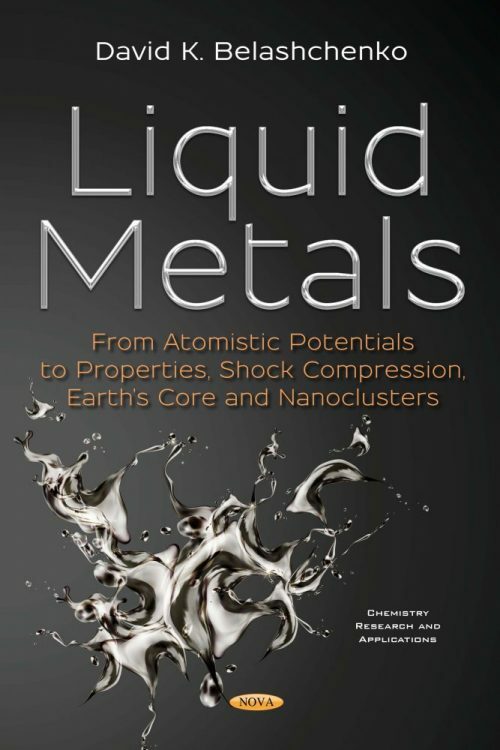 In the final chapters of the book, specific problems with respect to liquid metals are considered. Here, the problems of the structure and conditions in the center of the Earth, Moon and Jupiter satellites, calculations of shock adiabats, and the isotopic effect of diffusion are covered. The assessments of structure and temperature in the inner and outer cores of the Earth are given. Calculations of a series of shock adiabats for the initially porous or liquid metal samples are carried out, and questions of accuracy concerning the available experimental data are analyzed. Also, some non-classical mechanisms of liquid solidification, in particular, the cluster mechanism of solidification during strong overcooling, are discussed. The general problems of the thermodynamic description of nanoclusters are considered. The ambiguity of the use of the radius, volume, surface area and surface tension concepts for nanoclusters is shown, and a more reasonable approach is suggested. The series of nanoclusters of various sizes are constructed for several metals, and the dependence of their properties on the cluster size, including a melting temperature, are investigated. The possibility to compare the applicability of the Second Law of Thermodynamics in its usual form to the melting/solidification of nanoclusters is discussed. Plimpton S. J. //Comput. Phys. 1995. V. 117. P. 1. Berendsen H. J. C., van Gunsteren W. F. 1984. Molecular dynamics simulations: techniques and approach //In: Molecular liquids – dynamics and interactions. Ed. A. J. Barnes et al. D. Reidel Publ. P. 475. Belashchenko D. K. 1985. Structure of liquid and amorphous metals. Moscow. Ed. Metallurgy. 192 p. [Russian]. Belashchenko D. K., Tomashpolsky M. Yu. //Metals. 1967. No. 6. P. 137 [Russian]. Car R., Parinello M. //Phys. Rev. Letters. 1985. V.55. No 22. P. 2471. Tuckerman M. E. //J. Phys. Condens. Matter. 2002. V.14. R1297. Marx D., Hutter J. 2000. Modern methods and algorithms of quantum chemistry //NIC series. V.1. Ed. J. Grotendorst. Forschungszentrum Jülich. Monte Carlo methods in statistical physics. Ed. K. Binder. Springer–Verlag Berlin Heidelberg. 1986. 416 pages. Tsuji K., Hattori T., Mori T., et al. //J. Phys. : Condens. Matter. 2004. V.16. P. S989. Belashchenko D. K. //Crystallography Reports. 1998. V. 43. No 3. P. 362. Hansen J. P., McDonald I. R. 2006. Theory of simple liquids. 3rd Edition. Univ. of Cambridge. Academic Press. 416 p.
	Croxton C. A. 2009. Liquid state physics. A statistical mechanical introduction. Cambridge Univ. Press. 432 p.
	Kaplow R., Rowe T. A., Averbach B. L. //Phys. Rev. 1968. V.168. No 3. P. 1068. Evdokimenko O. A., Steinberg A. S., Alyokhin V. P. //Metallophysics. 1987. T. 9. No 15. P. 124 [Russian]. Evdokimenko O. A., Steinberg A. S., Barbash E. L. //Melts. 1987. V. 1. No. 2. P. 63 [Russian]. MvGreevy R. L., Pusztai L. //Mol. Simulation. 1988. V. 1. P. 359. McGreevy R. L., Howe M. A. //Ann. Rev. Mater. Sci. 1992. V. 22. P. 217. Belashchenko D. K., Mendelev M. I. //Izv. vuzov. Chernaya metallurgiya. 1992. No. 9. P. 110 [Russian]. Mendelev M. I., Belashchenko D. K. //Melts. 1992. No. 4. P. 60 [Russian]. Mendelev M. I., Belashchenko D. K. //Inorganic Materials. 1995. T.31. No. 2. P. 215 [Russian]. Belashchenko D. K., Mendelev M. I. //Melts. 1993. No. 1. P. 46 [Russian]. Belashchenko D. K. 2005. Computer simulation of liquid and amorphous substances: Scientific publication. Moscow. MISA. 408 p. [Russian]. Schommers W. //Phys. Rev. 1983. V. 28A. P. 3599. Belashchenko D. K., Momchev M. P. //Izv. vusov. Chernaya metallurgiya. 1992. No. 7. P. 72 [Russian]. Henderson R. L. //Phys. Lett. A. 1974. V. 49. P. 197. Chayes J. T., Chayes L. //J. Stat. Physics. 1984. V. 36. No 3–4. P. 471. Reatto L., Levesque D., Weis J. J. //Phys. Rev. A. 1986. V. 33. P. 3451. Reatto L. //Phil. Mag. 1988. V. 58A. No. 1. P. 37. Belashchenko D. K. //Metals. 1998. No. 4. P. 101 [Russian]. Canales M., Gonzalez L. E., Padro J. A. //Phys. Rev. E.: Stat. Phys., Plasmas, Fluids. 1994. V. 50. No 5. P. 3656. Belashchenko D. K., Belashchenko K. D. //Melts. 1989. No. 2. P. 32 [Russian]. Belashchenko D. K. //Russ. J. Phys. Chem. 2004. T.78. No. 9. P. 1423. Belashchenko D. K., Gelchinski B. R. //J. Non-Crystalline Solids. 2007. V. 353. Issues 32–40. P. 3515. Belashchenko D. K., Mendelev M. I. //Russ. J. Phys. Chem. 1995. T.69. No. 3. P. 543 [Russian]. Mendelev M. I. //J. Non-Cryst. Solids. 1998. V. 223. P. 230. Belashchenko D. K. //Russ. J. Phys. Chem. A. 2016. V. 90. No. 4. P. 707. Belashchenko D. K., Syrykh G. F. //Inorg. Mater. 2004. T.40. No. 5. P. 483. Pak H. M., Doyama M. //J. Fac. Engng Tokyo Univ. 1969. V. B30. P. 111. Belashchenko D. K., Ostrovski O. I. //CALPHAD. 2002. V. 28. No 4. P. 523. Belashchenko D. K., Ostrovsky O. I. //Russ. J. Phys. Chem. 2003. T. 77. No 4. P. 627. Belashchenko D. K., Ostrovsky O. I. //Russ. J. Phys. Chem. 2003. T. 77. No. 7. P. 1111. Belashchenko D. K., Ostrovsky O. I. //Russ. J. Phys. Chem. 2003. T. 77. No. 12. P. 1972. Belashchenko D. K., Ostrovsky O. I. //Inorg. Mater. 2004. T. 40. No. 3. P. 241. Belashchenko D. K., Mendelev M. I. //Metals. 1993. No. 5. P. 80 [Russian]. Belashchenko D. K. //Metals. 1989. No. 2. P. 156 [Russian]. Belashchenko D. K. //Russ. J. Phys. Chem. 2001. T. 75. No. 3. P. 387. Belashchenko D. K. //Inorg. Mater. 2001. T. 37. No. 4. P. 416. Alteholz Th., Hoyer W. //J. Non-Cryst. Solids. 1999. V. 250–252. P. 48. Takai T., Halicoglu T., Tiller W. A. //Scr. Met. 1985. V. 19. P. 715. Gordon R. G., Kim Y. S. //J. Chem. Phys. 1972. V. 56. No 6. P. 3122. Evald P. P. //Ann. Phys. 1921. Bd. 369. No 3. S. 253. Brush S. G., Sahlin H. L., Teller E. //J. Chem. Phys. 1966. V.45. N 6. P. 2102. Hansen J. P. //Phys. Rev. 1973. V. A8. N 6. P. 3096. Hockney R. W., Eastwood J. W. 1988. Computer simulation using particles. Bristol. Ed. Hilger. 540 p.
	Heyes D. M., Barber M., Clarke J. H. R. //J. Chem. Soc. Faraday Trans. 2. 1977. V.73. P. 1485. Rhee Y. J., Halley J. W., Hautman J., Rahman A. //Phys. Rev. B. 1989. V. 40. No 1. P. 36. Tosi M. P., Fumi F. G. //J. Phys. Chem. Liquids. 1964. V. 25. P. 45. Harrison W. A. 1966. Pseudopotentials in the Theory of Metals. Ed. W. A. Benjamin, Inc. 336 p.
	Zahid F., Bhuiyan G. M., Khaleque M. A., Rashid R. I. M. A. //J. Non-Crystalline Solids. 1999. V. 250–252. P. 107. Barker J. A., Henderson D., Smith W. R. //Mol. Phys. 1969. V. 17. P. 579. Louis A. A. //J. Phys. : Condens. Matter. 2002. V.14. P. 9187. Keating P. N. //Phys. Rev. 1966. V. 145. P. 637. Stillinger F. H., Weber T. A. //Phys. Rev. B. 1985. V. 31. No 8. P. 5262. Ding K., Andersen H. C. //Phys. Rev. B. 1986. V. 34. No 10. P. 6987. Vatolin N. A., Kibanova E. A., Polukhin V. A. //Repts of the Russ. Acad. Sci. 1997. V. 356. No. 1. P. 57 [Russian]. Tersoff J. //Phys. Rev. Lett. 1988. V. 61. No. 25. P. 2879. Tersoff J. //Phys. Rev. B. 1988. V. 37. No 12. P. 6991. Bazant M. Z., Kaxiras E. //Phys. Rev. Lett. 1996. V.77. P. 4370. Justo J. F., Bazant M. Z., Kaxiras E., et al. //Phys. Rev. B. 1998. V. 58. 2539. Marks N. A. //Phys. Rev. B. 2001. V. 63. 0635401. Axilrod B. M., Teller E. //J. Chem. Phys. 1943. V. 11. P. 299. Daw M. S., Baskes M. I. //Phys. Rev. Lett. 1983. V. 50. P. 1285. Voter A. F., Chen S. P. //In: R. W. Siegel, J. R. Weertman, R. Sinclair (Eds). 1987. Characterization of Defects in Materials, MRS Symposia Proceedings No 82, Materials Research Society, Pittsburg, p.175. Daw M. S., Baskes M. I. //Phys. Rev. B. 1984. V. 29. No 12. P. 6443. Finnis M. W., Sinclair J. E. //Phil. Mag. A. 1984. V. 50. P. 45. Sutton A. P., Chen J. //Philos. Mag. Lett. 1990. V. 61. P. 139. Ackland G. J., Vitek V. //Phys. Rev. B. 1989. V. 41. P. 10324. Mendelev M. I., Han S., Srolovitz D. J., et al. //Phil. Mag. A. 2003. V. 83. P. 3977. Mendelev M. I., Srolovitz D. J. //Phys. Rev. B. 2002. V. 66. P. 014205 (9). Johnson R. A., Oh D. J. //J. Mater. Res. 1989. V. 4. P. 1195. Cai J., Ye Y. Y. //Phys. Rev. B. 1997. V. 54. P. 8398. Dimitrov V. I. //Phys. Stat. Sol. (b). 1996. V. 196. P. 145. Zhang Q., Lai W. S., Liu B. X. //J. Non-Cryst. Solids. 2000. V. 261. P. 137. Zhou X. W., Wadley H. N. G., Johnson R. A., et al. //Acta mater. 2001. V. 49. P. 4005. Liu X. Y., Ercolessi F., Adams J. B. //Model. Simul. Mater. Sci. Engnrng. 2004. V. 12. Mishin Y., Mehl M. J., Papaconstantopoulos D. A. //Phys. Rev. B. 2002. V. 65. 224114. Alemany M. M. G., Calleja M., Rey C., et al. //J. Non-Crystalline Solids. 1999. V. 250–252. P. 53. Data on the website: http://potfit.itap.physik.uni-stuttgart.de/wiki/Main_Page. Plimpton S. J. //Comput. Phys. 1995. V. 117 P. 1. Baskes M. I. //Phys. Rev. B. 1992. V. 46. P. 2727. Yuan X., Takahashi K., Ouyang Y., Onzawa T. //J. Phys. Condens. Matter. 2003. V. 15. P. 8917. Jelinek B., Houze J., Kim S., et al. //Phys. Rev. B. 2007. V. 75. 054106. Dongare A. M, Neurock M., Zhigilei L. V. //Phys. Rev. 2009. V. 80. 184106. Lee B. J., Ko W. S., Kim H. K., Kim E. H. //Calphad. 2010. V. 34. No 4. P. 510. Belashchenko D. K., Smirnova D. E. //Russ. J. Phys. Chem. A. 2011. V. 85. P. 1908. Belashchenko D. K. //High Temp. 2012. V. 50. No 3. P. 331. Zharkov V. N., Kalinin V. A. 1971. Equations of State for Solids at High Pressures and Temperatures. New York: Consultants Bureau. Landau L. D, Lifshitz E. M. 1969. Statistical Physics. Oxford: Pergamon Press. Landau L. D, Lifshitz E. M. 1959. Fluid Mechanics. London: Pergamon Press. Belashchenko D. K. //High Temperature. 2015. V. 53. No 5. P. 649. Marx D., Hutter J. //In Modern Methods and Algorithms of Quantum Chemistry (NIC Ser., Vol. 1, Ed. J Grotendorst) (Jülich: John von Neumann Institute for Computing, 2000) p. 301. Tuckerman M. E. //Phys. Condens. Matter. 2002. V. 14. R1297. Kresse G., Furthmüller J. //Comput. Mater. Sci. 1996. V. 6. P.15. Vanderbilt D. //Phys. Rev. B. 1990. V.41. P. 7892. Hellman H. 1937. Einfuhrung in die Quantenchemie. [Introduction to quantum chemistry] Leipzig. : Deuticke. Kresse G. //J. Non-Cryst. Solids. 1995. V. 192–193. P. 222. Galli G., Martin R. M., Car R., Parrinello M. //Phys. Rev. B. 1990. V. 42. No 12. P. 7470. Kresse G., Hafner J. //Phys. Rev. B. 1993. V. 47. R558. Costa Cabral B. J., Martins J. L. //J. Non-crystalline Solids. 2002. V. 312–314. P. 69. Kresse G., Hafner J. //Phys. Rev. B. 1993. V. 48. P. 13115. Seifert K., Hafner J., Furthmueller J., Kresse G. //J. Phys. Cond. Matter. 1995. V. 7. P. 3683. Yonezawa F., Tanikawa H. //J. Non-crystalline Solids. 1996. V. 207. P. 793. Costa Cabral B. J., Cordeiro M. N. D. S., Telo da Gama M. M. //J. Phys. : Cond. Matter. 1991. V.3. No 29. P. 5615. Kirchhoff F., Holender J. M., Gillan M. J. //Phys. Rev. B. 1996. V. 54. No 1. P. 190. Sarnthein J., Pasquarello A., Car R. //Phys. Rev. B. 1995. V. 52. No 17. P. 690. Filon L. N. G. //Proc Roy. Soc. Edinburgh. 1929. V. 49. P. 38. Canales M., Gonzalez L. E., Padro J. A //Phys. Rev. E.: Stat. Phys., Plasmas, Fluids. 1994. V. 50. No 5. P. 3656. Stillinger F. H., Weber T. A. //J. Chem. Phys. 1978. V.68. No 8. P. 3837. Gereben O., Pusztai L., Baranyai A. //J. Phys. : Condens. Matter. 1994. V. 6. P. 10939. Rogers C. A. 1964. Packing and Covering. Cambridge Univ. Press. 120 p.
	Conway J. H., Sloane N. J. A. 1998. Sphere Packings, Lattices, and Groups. Springer Sciences + Business Media. N. Y. 706 p.
	Medvedev N. N. //Computational Phys. 1986. V. 67. No 1. P. 223. Medvedev N. N. 1994. Voronoi–Delaunay method in research of structure of non-crystalline packings. Novosibirsk: Ed. Novosibirsk Univ. 112 p. [Russian]. Hafner J. //Phys. Rev. B. 1983. V. 27. P. 678. Belashchenko D. K. //Inorganic Materials. 1996. V. 32. No 2. P. 160. Belashchenko D. K. //Inorganic Materials. 1996. V.32. No 3. P. 316. Hoheisen C., Vogelsang R. //Comput. Phys. Rep. 1988. V. 8. P. 1. Gosling E. M., McDonald I. R., Singer K. //Mol. Phys. 1973. V. 26. No 6. P. 1475. Belashchenko D. K. //Russ. J. Phys. Chem. 2006. V. 80. No 12. P. 1968. Belashchenko D. K., Ostrovski O. I. //RJPC. 2008. V. 82. No 3. P. 364. Steinhardt P. J., Nelson D. R., Ronchetti M. //Phys. Rev. B. 1983. V. 28. P. 784. Duijneveldt J. S., Frenkel D. //J. Chem. Phys. 1992. V. 96. P. 4655. Belashchenko D. K., Lobanov E. S. //Proc. EMMM-07 Int. Conf. 3–7 Sept. 2007. Ed. A. S. Avilov, S. L. Dudarev, L. D. Marks. AIP. Conf. Proc. 999. P. 202. Klumov B. A. //Physics–uspekhi. 2010. V. 180. No 10. P. 1095. Lutsko J. F., Wolf D., Phillpot S. R., Yip S. //Phys. Rev. B. 1989. V. 40. No 5. P. 2841. Belashchenko D. K., Ostrovskii O. I. //High Temp. 2009. V. 47. P. 211. Le Roux S., Petkov V. //J. Appl. Cryst. 2010. V. 43. P. 181. Humphrey W., Dalke A., Schulten K. //J. Mol. Graph. 1996. V. 14. No 1. P. 33. Gelchinski B. R., Mirzoev A. A., Belashchenko D. K., Winter R. //J. Non-Cryst. Solids. 1999. V.250–252. P. 40. Petkov V., Yunchov G. //J. Non-Cryst. Solids. 1995. V.192–193. P. 636. Rosato V., Lascovich J. C., Santoni A., Colombo L. //Int. J. Mod. Phys. C. 1998. V. 9. P. 917. Walters J. K., Gilkes K. W. R., Wicks J. D., Newport R. J. //Phys. Rev. B. 1998. V. 58. P. 8267. Petkov V., Yunchov G. //J. Phys. : Condens. Matter. V. 8. No 12. P. 1869. Tamura K., Hosokawa Sh. //Phys. Rev. B. 1998. V. 58. No 14. P. 9030. Alenkov V. V., Belashchenko D. K., Kuznetsov G. D. //Melts. 1989. No. 5. P. 65 (in Russian) [Russian]. Pustai L., Gereben O. //J. Non-Cryst. Solids. 1995. V. 192–193. P. 640. Belashchenko D. K. //Inorganic Materials. 2001. T. 37. No. 4. P. 416. Pusztai L., Svab E. //J. Non-Cryst. Solids. 1993. Vol. 156–158. P. 973. McGreevy R. L., Pusztai L. //Proc. Roy. Soc. London. 1990. V.430. P. 241. Pusztai L., Svab E. //J. Phys. : Condens. Matter. 1993. V.5. P. 8815. Mendelev M. I., Belashchenko D. K., Ishmayev S. N. //Inorganic Materials. 1993. T.29. No. 11. Page 1483 [Russian]. Belashchenko D. K., Mendelev M. I., Ishmaev S. N. //J. Non-Cryst. Solids. 1995. V.192–193. P. 623. Belashchenko D. K., Mendelev M. I. //Phys. Met. Metallogr. 1991. No. 8. P. 28 [Russian]. Mendelev M. I., Belashchenko D. K. //Inorganic. materials. 1995. T.31. No. 2. P. 215 [Russian]. van der Aart S. A., Verkerk P., Barnes A. C. et al. //Physica B. 1998. V. 241–243. P. 961. Howe M. A., McGreevy R. L. //J. Phys. : Condens. Matter. 1991. V. 3. P. 577. Lamparter P., Steeb S. //J. Non-Cryst. Solids. 1995. V.192–193. P. 578. Hoppe U., Kranold R. //Solid State Commun. 1999. V. 109. No 10. P. 625. Mountjoy G., Anderson R., Wicks J. D. et al. //J. Non-Cryst. Solids. 1998. V. 232–234. P. 227. Kang Sh., Park Ch., Saito M., Waseda Y. //Mater. Trans. JIM. 1999. V. 40. No 6. P. 552. Schempp S., Dürr J., Lamparter P. et al. //Z. Naturforsch. A. 1998. Bd. 53. No 3–4. S. 127. Cormier L., Calas G., Creux S. et al. //Phys. Rev. B. 1999. V. 59. P. 13517. Wicks J. D., McGreevy R. L. //J. Non-Cryst. Solids. 1995. V. 192–193. P. 23. Johnson M. D., Hutchinson P., March N. H. //Proc. Roy Soc. A. 1964. V. 282. P. 283. Verlet L. //Phys. Rev. 1968. V. 165. No 1. P. 201. Belashchenko D. K., Magidson I. A. //Izv. vusov. Chernaya metallurgiya. 1983. No. 3. P. 5 [Russian]. Belashchenko D. K., Momchev M. P. //Izv. vusov. Chernaya metallurgiya. 1992. N5. P. 91 [Russian]. Belashchenko D. K. //Russ. J. Phys. Chem. 2001. T. 75. No. 1. P. 81. Waseda Y. 1980. The Structure of Non-Crystalline Materials. Liquids and Amorphous Solids. N. Y. McGraw-Hill, 325 p.
	Mikhaylova L. E., Khristenko T. M., Ilyinsky A. G., Romanova A. V. Structure factors of liquid tin in the range of temperatures to 1973 K //Preprint Inst. Metal Physics. AS USSR. No IMF 30.87. Kiev, 1987. Frohberg G., Kraatz K. H., Wever H. //Proc. 5th European Symp. on Material Sciences under Microgravity. Schloss Elmau. 5–7 Nov. 1984, P. 201. Mendelev M. I., Belashchenko D. K. //Inorganic. Materials. 1994. T. 30. No. 11. P. 1412 [Russian]. Belashchenko D. K., Ginzburg A. S. //Russ. J. Phys. Chem. 2001. V. 75, No 5. P. 790. Belashchenko D. K. //High temp. 2002. T. 40. No. 2. P. 212. Data on the website: http://www-mls.ias.hiroshima-u.ac.jp//.tamura02/index.html). Swalin R. A. //Acta met. 1959. V. 7. P. 736. Munejiri Sh., Shimojo F., Hoshino K. //J. Phys. Condens. Matter. 1998. V. 10. P. 4963. Tamura K., Hosokawa S. //J. Phys. Condens. Matter. 1995. V. 6. P. 419. Kresse G., Hafner J. //Phys. Rev. B. 1997. V. 55. No 12. P. 7539. Munejiri Sh., Shimojo F., Hoshino K., Watabe M. //J. Non-Cryst. Solids. 1996. V. 205–207. P. 278. Winter R., Bodensteiner T., Glaser W., Hensel F. //Ber. Bunsenges. Phys. Chem. 1987. Bd. 91. S.
	Munejiri Sh., Shimojo F., Hoshino K., Watabe M. //J. Phys. : Condens. Matter. 1997. V.9. P. 3303. Belashchenko D. K., Ginzburg A. S. //Sov. Phys. JETP. 1999. T.115. No. 1. P. 50 [Russian]. Belashchenko D. K., Ginzburg A. S., Mendelev M. I. //Russ. J. Phys. Chem. 2000. V. 74. No. 4. P. 577. Blagonravov L. A., Skovorod’ko S. N., Krylov A. S. et al. //J. Non-Cryst. Solids. 2000. V. 277. P. 182. Belashchenko D. K. //Russ. J. Phys. Chem. 2014. V. 88. No 9. P. 1533. Arai T., Yokoyama I., Waseda Y. //J. Non-Cryst. Solids. 1990. V. 117–118. P. 96. Belashchenko D. K., Momchev M. P. //Izv. Vusov. Chernaya metallurgiya. 1992. No 7. P. 72 [Russian]. Bellissent-Funel M. S., Desre P. J., Bellissent R. et al. //J. Phys. F. 1977. V. 7. P.
	Mendelev M. I., Belashchenko D. K. //Inorganic. Materials. 1994. V.30. No 3. P. 379 [Russian]. Mendelev M. I. //Physica B. Condens. Matter. 1999. V.262. P.40. Mendelev M. I. //J. Non-Cryst. Solids. 1998. V.232–235. P. 560. Belashchenko D. K., Ostrovski O. I. //Inorganic Materials. 2004. V. 40. No. 6. P. 576. Belashchenko D. K. //Russ. J. Phys. Chem. 2004. V. 78. No 9. P. 1423. Belashchenko D. K. //Russ. J. Phys. Chem. 2001. V. 75. No. 3. P. 387. Mendelev M. I., Belashchenko D. K. //Metals. 1995. No. 3. P. 21 [Russian]. Pak H. M., Doyama M. //J. Fac. Engng Tokyo Univ. 1969. V.B30. P.111. Belashchenko D. K., Zemlyanov M. G., Ishmayev S. N., Syrykh G. F. //Phys. Met. Metallogr. 2002. V. 93. No 6. P. 5. Ishmaev S. N., Isakov S. L., Sadikov I. P. et al. //J. Non-Cryst. Solids. 1987. V. 94. No 1. P. 11. Ishmaev S. N., Lisichkin Y. V., Puchkov A. V. et al. //Materials Science Forum. 2000. V.321–325. P.502. Mendelev M. I., Belashchenko D. K., Ishmaev S. N. //J. Non-Cryst. Solids. 1996. V. 205–207. P.888. Belashchenko D. K., Syrykh G. F. //Inorganic. Materials. 2004. V. 40. No 5. P. 483. Svab E., Meszaros Gy., Konczos G. et al. //J. Non-Cryst. Solids. 1988. V. 104. P. 291. Bernal J., King S. 1968. Experimental simulation of simple liquids. In “Physics of simple liquids. Statistical theory.” H. N. V. Temperley, J. Sh. Rowlinson, G. S. Rushbrooke. Wiley Inter-science Div. 713 p.
	Finney J. L. //Proc. Roy Soc. A. 1970. V. 319. P. 479, 495. Belashchenko D. K. 1985. Structure of liquid and amorphous metals. M. Ed. Metallurgy. 192 p. [Russian]. Wertheim M. S. //Phys. Rev. Letters. 1963. V. 10. P. 321. Thiele E. J. //J. Chem. Phys. 1963. V. 38. P. 1959. Carnahan N., Starling K. //J. Chem. Phys. 1969. V.51. P. 635. Topuridze N. I., Khantadze D. V. //Russ. J. Phys. Chem. 1978. T. 52. No. 1. P. 81 [Russian]. Mansoori G. A., Carnahan N. F., Starling K. E. //J. Chem. Phys. 1971. V.54. P. 1523. Umar I. H., Yokoyama I., Young W. H. //Phil. Mag. 1976. V.34. P. 535. Belashchenko D. K. //Russ. J. Phys. Chem. 2002. V. 76. No 8. P. 1302. Belashchenko D. K., Polyansky R. A., Pavlov R. N. //Russ. J. Phys. Chem. 2002. V. 76. No. 3. P. 454. Belashchenko D. K. 1970. The Transfer Phenomena in Liquid Metals and Semiconductors. Moscow. Atomizdat. 399 p. [Russian]. Belashchenko D. K. 2005. Computer Simulation of Liquid and Amorphous Substances. Moscow. MISIS. 408 p. [Russian]. Krueger G. J., Mueller-Warmuth W., Klemm A. //Z. Naturforsch. 1971. Bd. 26a. S. 94. Lozovoj V. I., Ogloblja V. I. //Repts Acad. Sci. Ukr. SSR. Ser. A. 1979. No. 10. P. 870 [Russian]. Lozovoj V. I., Ogloblja V. I. //Proc. Acad. Sci. Ukr. SSR. Metals. 1980. No. 4. P. 53 [Russian]. Kluge M., Schober H. R. //Phys. Rev. E. 2000. V. 62 (1). P. 597. Belashchenko D. K. //Metal physics and metallography. 1987. V. 63. No. 4. P. 665 [Russian]. Belashchenko D. K. //Melts. 1987. V. 1. No. 3. P. 45 [Russian]. Hoover W. G., Gray S. G., Johnson K. W. //J. Chem. Phys. 1971. V. 55. No 3. P. 1128. Belashchenko D. K. //Metals. 1990. No. 1. P. 166 [Russian]. Belashchenko D. K., Borisov A. P., Shinkarev A. N. //Metals. 1981. No. 1. P. 51 [Russian]. Matz W., Hermann M., Mattern N. //J. Non-Cryst. Solids. 1987. V. 93. No 2–3. P. 217. Dzugutov M., Dahlborg U. //J. Non-Crystalline Solids. 1991. V. 131–133. Part 1. P. 62. Doye J. P. K., Wales D. J. //Phys. Rev. Letters. 2001. V. 86. No 25. P. 5719. Fomin Yu. D., Gribova N. V., Ryzhov V. N. //Defect and Diffusion Forum. 2008. V. 227. P. 155. Fomin Yu. D., Gribova N. V., Ryzhov V. N., et al. //J. Chem. Phys. 2008. V. 129. P. 064512. Gribova N. V., Fomin Yu. D., Frenkel D., Ryzhov V. N. //Phys. Rev. E. 2009. V. 79. P. 051202. Gaiduk Eu. A., Fomin Yu. D., Ryzhov V. N. et al. //arXiv.org >cond.mat> arXiv:1507.03775. Martynyuk M. M. Phase transitions at impulse heating [in Russian]. RUDN Publ. 1999. Moscow. 332 p.
	Data on the website: http://www.webelements.com. Bystrov P. I., Kagan D. N., Krechetova G. A., Shpilrayn E. E. Liquid-metals heat carriers of thermal pipes and power installations [Russian]. Science Publ. 1988. Moscow. 264 p.
	Waseda Y. 1980. The Structure of Non-Crystalline Materials. Liquids and Amorphous Solids. N. Y. McGraw-Hill Ed. 325 p.
	Data on the website: http://res.tagen.tohoku.ac.jp/~waseda/scm/index.html. Olbrich H., Ruppersberg H., Steeb S. //Z. Naturforsch. A. 1983. Bd. 38. S. 1328. Van der Lugt W., Alblas B. P. 1985. Structure Factor of Liquid Alkali Metals //In Handbook of thermodynamic and transport properties of alkali metals. Ed. Ohse R. W. Oxford: Blackwell Scient. Publ. Chapter 5.1. P. 299–319. Salmon P. S., Petri I., de Jong P. et al. //J. Phys. : Condens. Matter. 2004. V.16. P. 195. Canales M., Gonzalez L. E., Padro J. A. //Phys. Rev. E.: Stat. Phys., Plasmas, Fluids. 1994. V. 50. P. 3656. Belashchenko D. K., Ostrovsky O. I. //High Temp. 2009. T.47. No. 2. P. 211. Belashchenko D. K. //High Temp. 2012. T. 50. No. 3. P. 331. Belashchenko D. K. //Inorg. Mater. 2012. T. 48. No. 1. P. 79. Belashchenko D. K. //High Temp. 2013. T. 51. No. 5. P. 626. Belashchenko D. K. //Physics–Uspekhi. 2013. V. 56. No 12. P. 1176. Vaidya S. N., Getting I. C., Kennedy G. C. //J. Phys. Chem. Solids. 1971.V. 32. P. 2545. Rice M. H. //J. Phys. Chem. Solids. 1965. V. 26. P. 483. Bakanova A. A., Dudoladov I. P., Trunin R. F. //Fizika tverdogo tela [Russian]. 1965. V.
	Compendium of shock wave data (Ed. M. van Thiel) (Livermore: Lawrence Livermore Laboratory. Report UCRL–50108. 1977) p. 323. LASL Shock Hugoniot Data. (Ed. S. P. Marsh) (Univ. California Press, Berkeley, 1980). Data on the website: www.ihed.ras.ru/rusbank. Landau L. D., Lifshitz E. M. 1980. The course of theoretical physics. V.5. Statistical Physics. Part 1. 3rd Ed. Pergamon Press. 542 p.
	Belashchenko D. K. //Russ. J. Phys. Chem. 2015. T. 89. No. 11. P. 2051. Metya A. K., Hens A., Singh J. K. //Fluid Phase Equilibria. 2012. V. 313. P.16. Blagoveshchenskij N. M., Morozov V. A., Novikov A. G. et al. //Crystallography Reports. 2007. T. 52, No. 3. P. 460. Casas J., Gonzalez D. J., Gonzalez L. E. et al. //Phys. Rev. 2000. B. V. 62. 12095. Handbook of Thermodynamic and Transport Properties of Alkali Metals. Ed. Ohse R. W. Oxford: Blackwell, 1985. Ott A., Lodding A. //Naturforsch. 1965. B. 20a. S. 1578. Krueger G. J., Mueller-Warmuth W., Klemm A. //Z. Naturforsch. 1971. B. 26a. No. 1. S. 94. Fraile A., Cuesta-López S., Iglesias R. et al. //J. Nuclear Materials. 2013. V. 440. P. 98. Grover R., Keeler R. N., Rogers F. J., Kennedy G. C. //J. Phys. Chem. Solids. 1969. V. 30. P. 2091. Belashchenko D. K. //High Temp. 2009. T. 47. No. 4. P. 494. Raty J. Y., Schwegler E. R., Bonev S. A. Electronic and Structural Transitions in Dense Liquid Sodium //Report LLNL. 2007. No UCRL–TR–233403. P. 1–19. Young D. A., Ross M. //Phys. Rev. B. 1984. V. 29. No 2. P. 682. Apfelbaum E. M., Vorob'ev V. S., Martynov G. A. //Chem. Phys. Letters. 2005. V.413. P. 342. McAlistert S. P., Crozier E. D., Cochran J. F. //J. Phys. F: Metal Phys. 1976. V. 6. No 8. P. 1415. Tonkov E. Yu., Ponyatovsky E. G. 2005. Phase transformations of elements under high pressure. CRC Press. 377 p.
	Ghiringhelli L. M., Los J. H., Meijer E. J. et al. //Phys. Rev. B. 2004. V. 69. 100101. Belashchenko D. K. //High Temp. 2015. T. 53. No. 5. P. 649. Steinhardt P. J., Nelson D. R., Ronchetti M. //Phys. Rev. B. 1983. V.28. No. 2. P. 784.
	van Duijneveldt J. S., Frenkel D. //J. Chem. Phys. 1992. V. 96. No 6. P. 4655. Bridgman P. W. //Rev. Modern Phys. 1946. V. 18. No 1. P. 1. Belashchenko D. K., Ostrovsky O. I. //Russ. J. Phys. Chem. 2008. T. 82. No. 3. P. 364. Guillaume Ch. L., Gregoryanz E., Degtyareva O. et al. //Nature Physics. 2011. V. 7. P. 211. Gan X., Xiao Sh., Deng H. et al. //Fusion Engineering and Design. 2014. V. 89. P. 2946. Bystrov P. I., Kagan D. N., Krechetova G. A., Shpilrayn E. E. 1988. Liquid-metals heat carriers of thermal pipes and power installations [Russian]. Science Publ. Moscow. 264 p.
	Data on the website: www.webelements.com. Gregoryanz E., Lundegaard L. F., McMahon M. I., et al. //Science. 2008.V. 320. No 5879. P. 1054. Vargaftik N. B., Kozhevnikov V. F., Alekseev V. A. Density of liquid cesium and sodium //In: Handbook of Thermodynamic and Transport Properties of Alkali metals. Ed. Roland W. Ohse. Blackwell Sci. Publ. 1985. P. 471. Grover R. //J. Phys. Chem. Solids. 1971. V.32. P. 2539. Vaidya S. N., Getting I. C., Kennedy G. C. //J. Phys. Chem. Solids. 1971. V. 32. P. 2545. Hultgren R., Desai P. D. Hawkin D. T, et al. 1973. Selected Values of the Thermodynamic Properties of the Elements. Am. Soc. Metals. Metal Park, OH. Basin A. C., Genrich V. N., Caploon A. V., etc. //Teplofizicheskie svojstva zhidkostej [Russian]. Moscow: “Science.” 1973. Page 14–19. Makarenko I. N., Nikolayenko A. M., Stishov S. M. //Obzory po teplofizicheskim svojstvam veshchestv [Russian]. No 5 (61). IVTAN RAS USSR. Moscow. 1986. P. 68. Raty J. Y., Schwegler E. R., Bonev S. A. Electronic and Structural Transitions in Dense Liquid Sodium //Report LLNL. 2007. No UCRL–TR–233403. P. 1. Marsh S. P. (Ed.). 1980. LASL Shock Hugoniot Data //Univ. California Press, Berkeley. Data on the website: www.rusbank.ru. Belashchenko D. K. //High Temper. 2013. T. 51. No 5. P. 626. Bakanova A. A., Dudoladov I. P., Trunin R. F. //Fizika tverdogo tela [Solid State Physics] [Russian]. 1965. V. 7. P. 1615 [Russian]. Al'tshuler L. V., Bakanova A. A. //Physics–uspekhi [Advances in Physical Sciences] [Russian]. 1968. V. 96. No 2. P. 193. Anderson M. S., Swenson C. A. //Phys. Rev. B. 1983. V. 28. No 10. P. 5395. Tatarinova L. I. 1983. Struktura tverdykh amorfnych i zhidkich veshchestv [Structure of solid amorphous and liquid substances] [Russian]. M.: Science. 151 p.
	Popel S. I., Spiridonov M. A., Zhukova L. A. 1997. Atomnoe uporjadochenie v zhidkikh i amorfnykh metallakh [Atomic ordering in liquid and amorphous metals] [Russian]. Yekaterinburg. 383 p.
	Pastukhov E. A., Vatolin N. A., Lisin V. L., et al. 2003. Difrakzionnye issledovanija stroenija vysokotemperaturnykh rasplavov [Diffraction studies of the structure of high-temperature melts] [Russian]. Ekaterinburg. 353 pages. Waseda Y. 1980. The Structure of Non-Crystalline Materials. Liquids and Amorphous Solids. N. Y.: McGraw Hill, 325 p.
	Katayama Y., Tsuji K. //J. Phys. Condens. Matter. 2003. V. 15. P. 6085. Vasin M. G., Ladyanov V. I. //Vestnik Udmurtskogo universiteta. Physika. 2005. No 4. P. 99. Matsuda K., Tamura K., Inui M. //Phys. Rev. Letters. 2007. V. 98. 096401. Greenfield A. J., Wellendorf J., Wiser N. //Phys. Rev. A. 1971. V. 4. No 4. P. 1607. Singh Sh., Sood J., Tankeshwar K. //J. Non-Crystalline Solids. 2007. V.353. P. 3134. Data on the website http://res.tagen.tohoku.ac.jp/~waseda/scm/index.html. Gonzalez Miranda J. M., Torra V. //J. Phys. F: Metal Phys. 1983. V.13. No 2. P. 281. Polukhin V. A., Bratkovskii A. M., Vaks V. G. //phys. status solidi B. 1985. V.130. No 1. P. 87. Belashchenko D. K. //High Temper. 2009. V.47. No 4. P. 494. Belashchenko D. K. //Inorgan. Materials. 2012. V. 48. No 1. C. 79. Belashchenko D. K. //High Temper. 2012. V. 50. No 3. P. 331. Belashchenko D. K. //Physics–uspekhi. 2013. V. 183. No 12. P. 1176. Kresse G. J. //J. Non-Crystalline Solids. 1995. V.192–193. P. 222. Silvestrelli P. L., Alavi A., Parrinello M. //Phys. Rev. B: Condens. Matter. 1997. V. 55. No 23. P. 15515. Senda Y., Shimojo F., Hoshino K. //J. Phys. Soc. Japan. 1998. V.67. P. 2753. Grosdidier B., Al-Busaidi M. S., Osman S. M. //J. Non-Crystalline Solids. 2007. V. 353. P. 3484. Belashchenko D. K. //Russ. J. Phys. Chem. 2015. T. 89. No 11. P. 2051. Hensel F., Marceca E., Pilgrim W. C. //J. Phys. : Condens. Matter. 1998. V. 10. P. 11395. Belashchenko D. K. //Russ. J. Phys. Chem. 2016. T. 90. No 9. P. 1707. Bridgman P. W. //Proc. Am. Acad. Arts and Sci. 1942. V. 74. P. 425. Boehler R. //Phys. Rev. B. 1983. V. 27. No 11. P. 6754. Swenson C. A. //Phys. Rev. B. 1985. V. 31. No 2. P. 1150. Apfelbaum E. M., Vorob'ev V. S., Martynov G. A. //Chem. Phys. Letters. 2005. V. 413. P. 342. Fokin L. R. //High Temper. 2012. T. 50. No 3. P. 437. Yuryev A. A., Gelchinsli B. R. //Doklady Physics. 2015. V. 60. No 3. P. 105. Martynyuk M. M. 1999. Phase transitions at impulse heating [Russian]. RUDN Publ. Moscow. 332 p.
	Data on the website: http://res.tagen.tohoku.ac.jp/~waseda/scm/AXS/. Monaco A., Scopigno T., Benassi P., et al. //J. Non-Crystalline Solids. 2007. V. 353. P. 3154. Makarenko I. N., Nikolaenko A. M., Stishov A. N. //Inst. Phys. Conf. Ser. 1977. No 30. Chapter 1. Part 1. P. 79. Makarenko I. N., Nikolayenko A. M., Stishov S. M. //JETP [Russian]. 1978. T. 74. No. 6. P. 2175. Bakanova A. A., Dudoladov I. P., Trunin R. F. //Fizika tverdogo tela [Russian]. 1965. V. 7. P. 1615. Rice M. H. //J. Phys. Chem. Solids. 1965. V. 26. P. 483. LASL Shock Hugoniot Data (Ed S. P. Marsh) (Univ. California Press, Berkeley, 1980). Zhernokletov M. B., Zubarev B. H., Trunin R. F., Fortov V. E. 1996. Experimental data on shock compressibility and adiabatic expansion of condensed substances at the high density of energy [Russian]. Chernogolovka. VNIIEF (Arzamas–16). 1996. 388 p.
	Al'tshuler L. V., Bakanova A. A. //UFN. 1968. T. 90. No. 2. P. 193. Lai S. K., Li W., Tosi M. P. //Phys. Rev. A. 1990. V. 42. P. 7289. Polukhin B. A., Ukhov V. F., Dzugutov M. M. 1981. Kompjuternoe modelirovanie dinamiki i struktury zhidkikh metallov [Computer modeling of dynamics and structure of liquid metals] [Russian]. Moscow. Science Publ. Kuzin V. V., Novikov A. G., Savostin V.0 V. et al. //Izv. Vuzov. Atomnaja energetika [Russian]. 2000. No 1. P. 40. Belashchenko D. K. //Russ. J. Phys. Chem. A. 2009. T.83. No. 2. P. 260. Belashchenko D. K., Smirnova D. E. //Russ. J. Phys. Chem. A. 2011. V. 85. No 11. P. 1908. Belashchenko D. K. //TVT. 2012. T. 50. No. 3. P. 331. Rohlin J., Lodding A. //Z. Naturforsch. 1962. B. 17a. S. 1081. Belashchenko D. K. //Russ. J. Phys. Chem. A. 2016. V. 90. No. 9. P. 1707. Belashchenko D. K. //Russ. J. Phys. Chem. A. 2015. T. 89. No. 11. P. 2051. Boehler R. //Phys. Rev. 1983. V. 27. No 11. P. 6754. McBride E. E. On Structural Studies of High-Density Potassium and Sodium. Ph.D. Thesis //Univ. of Edinburg. 2013. Narygina O., McBride E. E., Stinton G. W., McMahon M. I. //Phys. Rev. B. 2011. V. 84. 054111. Jüngst S., Knuth B., Hensel F. //Phys. Rev. Letters. 1985. V. 55. No 20. P. 2160. Grover R. //J. Phys. Chem. Solids. 1971. V. 32. P. 2539. Hultgren R., Desai P. D., Hawkin D. T., et al. 1973. Selected Values of the Thermodynamic Properties of the Elements. American Society for Metals, Metal Park, OH. Basin A. S. //In: Issledovanie teplofizicheskikh svojstv veshestv. Novosibirsk. Ed. “Nauka.” 1970. Pp. 81-123 [Russian]. Basin A. S., Solovyov A. N. //In: Teplofizicheskie svojstva zhidkostej. Moscow. Ed. “Nauka.” 1970. Pp. 99-103 [Russian]. Basin A. S., Genrich V. N., Kaplun A. V., etc. //In: Teplofizicheskie svojstva zhidkostej. Moscow. Ed. “Nauka.” 1973. P. 14-19 [Russian]. Winzenick M., Vidjayakumar V., Holzapfel W. B. //Phys. Rev. B. 1994. V. 50. No 17. P. 12381. Bridgman P. W. 1949. Physics of high pressures. G. Bell & Sons. 445 p.
	Makarenko I. N., Nikolayenko A. M., Stishov S. M. //JETP. 1978. T. 74. No 6. P. 2175. Tsuji K., Katayama Y., Morimoto Y., Shimomura O. //J. Non-Cryst. Solids. 1996. V. 205-207. P. 205. Marsh S. P. (Ed.). LASL Shock Hugoniot Data //Univ. California Press, Berkeley, 1980. Belashchenko D. K. //High Temp. 2013. V. 51. No 5. P. 626. Franz G., Freyland W., Gläser W., et al. //J. Physique (Paris). Coll. 1980. V.41. No C8. P. 194. Waseda Y. 1980. The Structure of Non-Crystalline Materials. Liquids and Amorphous Solids. N. Y. McGraw Hill, 325 p.
	Hong Seok Kang, Sung Ho Park //Bull. Korean Chem. Soc. 1999. V. 20. No 11. P. 1288. Hosokawa S., Pilgrim W. C., Hensel F., et al. //J. Non-Cryst. Solids. 1999. V. 250-252. P.159. Vasin M. G., Ladyanov V. I. //Vestnik Udmurtskogo universiteta. Fizika. 2005. No 4. P. 99 [Russian]. Matsuda K., Tamura K., Inui M. //Phys. Rev. Letters. 2007. V.98. P. 096401. Shimojo F., Hoshino K., Zempo Y. //J. Phys. Soc. Jpn. 1998. V.67. P.3471. Shimojo F., Aniya M., Hoshino K., Zempo Y. //J. Non-Crystalline Solids. 2007. V. 353. P. 3492. Hsu C. S., Rahman A. //J. Chem. Phys. 1979. V. 71. No12. P. 4974. Mandell M. J., McTague J. P., Rahman A. //Ibid. 1976. V. 64. No 9. P. 3699. Mandell M. J., McTague J. P., Rahman A. //Ibid. 1977. V. 66. No 7. P. 3070. Hsu C. S., Rahman A. //J. Chem. Phys. 1979. V. 70. No 11. P. 5234. Price D. L. //Phys. Rev. A. 1971. V. 4. No 1. P. 358. Price D. L., Singwi K. S., Tosi M. P. //Phys. Rev. B. 1970. V. 2. No 8. P. 2983. Schommers W. //Phys. Lett. 1973. V. 43A. P. 157. Munejiri Sh., Shimojo F., Hoshino K., Watabe M. //J. Non-Cryst. Solids. 1996. V. 205-207. P. 278. Munejiri Sh, Shimojo F, Hoshino K. //J. Phys. : Condens. Matter. 2000. V. 12. P. 4313. Belashchenko D. K. //Russ. J. Phys. Chem. 2006. V.80. No 10. P. 1567. Belashchenko D. K. //High Temp. 2010. V. 48. No 5. P. 646. Belashchenko D. K. //Inorg. Materials. 2012. V. 48. No 1. P. 79. Belashchenko D. K. //Physics-uspekhi. 2013. V. 183. No 12. P. 1176. Belashchenko D. K. //Russ. J. Phys. Chem. A. 2016. V. 90. No 9. P. 1707. Balucani U., Torcini A., Vallauri R. //Phys. Rev. B. 1993. V. 47. P. 3011. Belashchenko D. K. //Russ. J. Phys. Chem. 2015. V. 89. No 11. P. 2051. Söderlind P., Ross M. //J. Phys. : Condens. Matter. 2000. V.12. P. 921. Belashchenko D. K. //High Temp. 2009. V. 47. No 4. P. 494. Makarenko I. N., Nikolayenko A. M., Stishov S. M. Uravnenie sostojanija i termo-dinamika plavlenija shelochnykh metallov [Equation of state and thermodynamics of melting of alkali metals] [Russian] //Obsory teplofizicheskikh svojstv veshestv. 1986. No 5 (61). IVTAN Akademija nauk SSSR. Moscow. P. 68. Fokin L. R. //High Temp. 2012. T. 50. No 3. P. 467. Tatarinova L. I. 1983. Struktura tverdykh amorfnykh i zhidkikh veshestv [Structure of solid amorphous and liquid substances] [(Russian]. Moscow. Ed. "Nauka." Popel S. I., Spiridonov M. A., Zhukova L. A. 1997. Atomnoje uporjadochenie v rasplavlennykh i amorphnykh metallakh [Atomic ordering in molten and amorphous metals] [Russian]. Ekaterinburg. 383 p.
	Pastukhov E. A., Vatolin N. A., Lisin V. L., et al. 2003. Difrakcionnye issledovanija stroenija vysokotemperaturnykh rasplavov [Diffraction studies of the structure of high-temperature melts] [Russian]. Ekaterinburg. 353 p.
	Boehler R., Zha C. //Physika B. 1986. V. 140. P. 233. Üngst S., Knuth B, Hensel F. //Phys. Rev. Letters. 1985. V. 55. No 20. P. 2160. Vargaftik N. B., Kozhevnikov V. F., Alekseev V. A. //In: Handbook of Thermodynamic and Transport Properties of Alkali metals. Ed. R. W. Ohse. Blackwell Sci. Publ. 1985. P. 471. Bystrov P. I., Kagan D. N., Krechetova G. A., Shpilrayn E. E. 1988. Zhidkometallicheskiye teplonositely teplovykh trub i energeticheskikh ustanovok [Liquid metal heat carriers of heat pipes and power plants] [Russian]. M.: Science, 264 pages. Alekseev V. A., Ovcharenko V. G., Ryzhkov Yu. F., Senchenkov A. P. //Letters in JETP. 1970. V. 12. P. 306. Kozhevnikov V. F. //Sov. Phys. JETP. 1990. V. 70. No. 2. P. 298. Makarenko I. N., Nikolaenko A. M., Stishov S. M. //In: Liquid Metals. 1976. Ed. R. Evans and D. A. Greenwood. The Inst. of Physics. Conf. Series No 30. Bristol and London. Chapter 1. Part 1. P. 79. Rice M. H. //J. Phys. Chem. Solids. 1965. V. 26. P.
	Marsh S. P. (Ed.). 1980. LASL Shock Hugoniot Data //Univ. California Press. Berkeley. 1980. Waseda Y. 1980. The Structure of Non-crystalline Materials. Liquids and Amorphous Solids. McGraw-Hill, N. Y., 325 P.
	Winter R., Hensel F., Bodensteiner T., Glaser W. //Ber. Bunsenges. Phys. Chem. 1987. V. 91. P. 1327. Tsuji K., Yaoita K., Imai M., et al. //J. Non-Cryst. Solids. 1990. V. 117-118. P. 72. Falconi S., Lundegaard L. F., Hejny C., McMahon M. I. //Phys. Rev. Letters. 2005. V. 94. 125507(4). Matsuda K., Naruse S., Hayashi K. et al. //J. Physics: Conference Series. 2008. V. 98. P. 012003. Belashchenko D. K. //Crystallography Repts. 1998. V. 43. No. 3. P. 362. Kennedy G. C., Jayaraman A., Newton R. C. //Phys. Rev. 1962. V. 126. No 4. P. 1363. Jayaraman A., Newton R. C., McDonough J. M. //Phys. Rev. 1967. V. 159. P. 527. Vorontsov A., Mirzoev A. A., Vyatkin G. P., Sobolev A. //J. Non-Crystalline Solids. 2007. V. 353. P. 3206. Gomez S., Gonzalez L. E., Gonzalez D. J. et al. //J. Non-Crystalline Solids. 1999. V. 250–252. P. 163. Gelchinski B. R., Mirzoev A. A., Mitrokhin Yu. S., Dyuldina E. V. //J. Non-Crystalline Solids. 2007. V. 353. P. 3480. Gelchinski B. R., Mirzoev A. A., Belashchenko D. K., Winter R. //J. Non-Crystalline Solids. 1999. V. 250–252. P. 40. Belashchenko D. K., Ginzburg A. S. //Sov. Phys. JETP. 1999. T. 115. No. 1. P. 50. Bratkovski A. M., Vaks V. G., Kravchuk S. P., Trefilov A. V. //J. Phys. : Metal Phys. 1982. V. 12. No. 7. P. 1293. Belashchenko D. K., Nikitin N. Yu. //Russ. J. Phys. Chem. 2008. V. 82. No 8. P. 1283. Belashchenko D. K., Nikitin N. Yu. //J. Physics: Conference Series. 2008. V. 98. Belashchenko D. K. //Inorg. Materials. 2012. V. 48. P. 79. Belashchenko D. K. //High Temper. 2013. V. 51. No 5. P. 626. Belashchenko D. K. //Physics - Uspekhi. 2013. T. 183. No. 12. P. 1176. Chauhan A. S., Ravi R., Chabra R. //Chem. Phys. 2000. V. 252. P. 227. Kozhevnikov V. F., Naurzakov S. P., Senchenkov A. R. //J. Mоsсоw Phys. Soc. 1991. V. 1. P. 171. Bakanova A. A., Dudoladov I. P., Trunin R. F. //Fizika tverdogo tela. 1965. T. 7. P. 1615 [Russian]. Fokin L. R. //High Temper. 2012. V. 50. No. 3. P. 437. Popel S. I., Spiridonov M. A., Zhukova L. A. 1997. Atomnoje uporjadochenie v zhidkikh i amorfnykh metallakh [Atomic ordering in liquid and amorphous metals] [Russian]. Ekaterinburg. 383 pages. Tatarinova L. I. 1983. Struktura tverdykh amorfnykh i zhidkikh veshchestv [Structure of solid amorphous and liquid substances] [Russian]. Moscow. Ed. Nauka. 151 p.
	Pastukhov E. A., Vatolin N. A., Lisin V. L., et al. 2003. Diffrakzionnye issledovanija vysoko-temperaturnykh rasplavov [Diffraction studies of high-temperature melts] [Russian]. Ekaterinburg. 353 pages. Belashchenko D. K. //Russ. J. Phys. Chem. 2014. V. 88. No. 9. P. 1533. Martynyuk M. M. //Russ. J. Phys. Chem. 1998. V. 72. No 1. P.19. Gathers G. Thermophysical properties of matter //Rep. Progr. Phys. 1986. V. 49. No 4. P. 341. Gathers G. //Int. J. Thermophysics. 1983. V.4. P. 209. Gerasimov Ya. I., Krestovnikov A. N., Shakhov A. S. 1961. Khimicheskaya thermodynamika v zvetnoj metallurgii [Chemical thermodynamics in non-ferrous metallurgy] [Russian]. V.2. Moscow. Ed. Metallurgizdat. 262 p.
	Assael M. J. Kalyva A. E., Antoniadis K. D. et al. //J. Phys. Chem. Ref. Data. 2010. V. 39. No 3. 033105(8). Chase M. W., Jr. NIST-JANAF Thermochemical Tables. 4th Edition. //J. Phys. Chem. Ref. Data, Monograph 9, 1998, 1-1951. Filippov S. I., Kazakov N. B., Pronin L. A. //Izv. vysshikh uchebnykh zavedenij. [Izv. institutions of higher education.] Chernaja metallurgija. 1966. No 3. P. 8 [Russian]. Data on the website: http: //res.tagen.tohoku.ac.jp/~waseda/scm/AXS/. Tatarinova L. I. 1983. Structura tverdykh amorfnykh i zhidkikh veshchestv [Structure of solid amorphous and liquid substances][Russian]. Moscow. Ed. Nauka. 152 p.
	Belashchenko D. K., Zhuravlev Yu.V. //Inorg. Mater. 2008. V. 44. No 9. P. 939. Belashchenko D. K. //Inorg. Mater. 2012. V. 48. No 9. P. 940. Min Yan, Šob M., Luzzi D. E., et al. //Phys. Rev. B. 1993. V. 47. No 10. P. 5571. Valkealahti S., Manninen M. //J. Phys. : Condens. Matter. 1997. V. 9. P. 4041. Ackland G. J., Bacon D. J., Calder A. F., Harry T. //Phil. Mag. A. 1997. V.
75. No 3. P. 713. Alemany M. M. G., Calleja M., Rey C. et al. //J. Non-Crystalline Solids. 1999. V. 250-252. P. 53. Doyama M., Kogure Y. //Comput. Materials Science. 1999. V. 14. P. 80. Mishin Y., Mehl M. J., Papaconstantopoulos D. A. et al. //Phys. Rev. B. 2001. V. 63. 224106. Hoyt J. J., Garvin J. W., Webb E. B. III, Asta M. //Modelling Simul. Mater. Sci. Eng. 2003. V. 11. P. 287. Mendelev M. I., Kramer M. J., Becker C. A., Asta M. //Phil. Mag. 2008. V. 88. No 12. P. 1723. Zhang Tao, Gu Ting-kun, Zhang Xiao-ru //Modelling Simul. Mater. Sci. Eng. 2005. V. 13, No 5. P. 753. An Qi, Luo Sheng-Nian, Han Li-Bo, et al. //J. Phys. : Condens. Matter. 2008. V. 20. No 9. 095220. Belashchenko D. K. //Inorg. Mater. 2013. V. 49. No 5. P. 473.
	van Thiel M. (Ed.). Compendium of shock wave data (Livermore: Lawrence Livermore Laboratory Report UCRL-50108, 1977), 130.
	van Thiel M. (Ed.). Compendium of shock wave data (Livermore: Lawrence Livermore Laboratory Report UCRL-50108, 1977), 142. Al'tshuler L. V., Bakanova A. A., Dudoladov I. P., et al. //J. Appl. Mech. Techn. Phys. 1981. V. 22. P. 145. Glushak B. L., Zharkov A. P., Zhernokletov M. F., et al. //Soviet JETP. 1989. V. 96. P. 1301. Marsh S. P. (Ed.). LASL Shock Hugoniot Data. (Univ. California Press, Berkeley, 1980). Al'tshuler L. V., Kormer S. B., Bakanova A. A., Trunin R. F. //Soviet JETP. 1960. V. 38. No 3. P. 790. Gerasimov Ya. I., Krestovnikov A. N., Shakhov A. S. 1961. Khimicheskaya termodinamika v tsvetnoy metallurgii [Chemical thermodynamics in non-ferrous metallurgy] [Russian]. V.2. Moscow. Ed. Metallurgiya. 263 p.с. Data on the website: http://res.tagen.tohoku.ac.jp/~waseda/scm/LIQ/gr.html. Assael M. J., Kalyva A. E., Antoniadis K. D., et al. //High Temp.-High Press. 2012. V. 41. P. 161. Kirshenbaum A. D., Cahill J. A., Grosse A. V. //J. Inorganic and Nuclear Chemistry. 1962. V. 24. No 3. P. 333. Filippov S. I., Kasakov N. B., Pronin L. A. //Izv. vusov. Chernaya metallurgiya. 1966. No 3. P. 8 [Russian]. Alteholz Th., Hoyer W. //J. Non-Crystalline Solids. 1999. V. 250-252. P. 48. Belashchenko D. K. //Crystallography Reports. 1998. V. 43. No 3. P. 400. Mendelev M. I., Belashchenko D. K. //Inorg. Mater. 1995. V. 31, No 2. P. 215. Belashchenko D. K. //Inorg. Mater. 2012. V. 48. No. 9. P. 940. Marsh S. P. (Ed.). LASL Shock Hugoniot Data (Univ. California Press, Berkeley, 1980). Belashchenko D. K. //Inorg. Mater. 2013. V. 49. No 5. P. 450. Leak V., Swalin R. A. //Trans. Met. Soc. AIME. 1964. V. 230. P. 426. Belashchenko D. K., Lobanov E. S. //CP999. Electron Microscopy and Multiscale Modeling, EMMM-2007. Ed. A. S. Avilov, S. L. Dudarev, L. D. Marks. 2008. Amer. Inst. Phys. P. 202. CRC Handbook of Chemistry and Physics. 89th Edition. Ed. Lide D. R. CRC Press. 2008-2009. 2736 p.
	Stankus S. V., Khayrullin R. A. Izmenenie termicheskikh svojstv zinka, sur'my i tallija pri plavlenii [The change in the thermal properties of zinc, antimony and thallium upon melting] [Russian] //Teplofizicheskie svojstva veshchestv i rastvorov. Novosibirsk. 1988. P. 18. Wilson D. R. 1972. Structure of liquid metals and alloys. Moscow. Ed. Metallurgija. 248 p.
	Martin-Garin L., Bedon P., Desre P. //J. chem. phys. et phys. - chem, biol. 1973. V. 70. No 1. P. 112. Regel A. R., Glazov V. M. 1984. Fizicheskie svojstva elektronnykh rasplavov [Physical properties of electron melts] [Russian]. Moscow. Ed. Metallurgija. 296 p.
	Assael M. J., Armyra I. J., Brillo J., et al. //J. Phys. Chem. Ref. Data. 2012. V. 41. No 3. P. 03310 (16). Data on the website: http://www.webelements.com/. Filippov S. I., Kazakov N. B., Pronin L. A. //Izv. vysshikh uchebnykh zavedenij. [Izv. institutions of higher education] Chernaja metallurgija. 1966. No. 3. P. 8 [Russian]. Data on the website: http://res.tagen.tohoku.ac.jp/~waseda/scm/AXS/index.html. Etherington G., Wagner C. N. J. //J. Non-Crystalline Solids. 1984. V. 61-62. Part 1. P. 325. Belashchenko D. K. //High Temp. 2012. V. 50. No 1. P. 61. Belashchenko D. K. //Crystallography Repts. 1998. V. 43. No 3. P. 362. Lai S. K., Li W., Tosi M. P. //Phys. Rev. A. 1990. V. 42. No 12. P. 7289. Zahid F., Bhuiyan G. M., Khaleque M. A., Rashid R. I. M. A. //J. Non-Crystalline Solids. 1999. V. 250-252. P. 107. Römer F., Kraska T. //J. Chem. Phys. 2007. V. 127. P. 234509 (10). Römer F., Braun S., Kraska T. //Phys. Chem. Chem. Phys. 2009. V. 11. P. 4039. Ramprasad R., Hoagland R. G. //Modelling Simul. Mater. Sci. Eng. 1993. V. 1. P. 189. Walsh J. M., Rice M. H., McQueen R. G., Yarger F. L. //Phys. Rev. 1957. V. 108. P. 196. Al'tshuler L. V., Krupnikov K. K., Brazhnik M. I. //JETP. 1958. V. 34. P. 886 [Russian]. McQueen R. G., Marsh S. P. //J. Appl. Phys. 1960. V. 31. P. 1253.
	van Thiel M. (Ed.). 1977. Compendium of shock wave data. (Livermore: Lawrence Livermore Laboratory Report UCRL-50108). P. 113 and 118. Marsh S. P. (Ed.). 1980. LASL Shock Hugoniot Data. Univ. California Press. Berkeley. Al'tshuler L. V., Bakanova A. A., Dudoladov I. P., et al. //JAMTP. 1981. V. 2. P. 3. Volkov K. V., Sibilev V. A. //JAMTP. 1984. V. 1. P. 125. Trunin R. F., Simakov G. V. //Mat. Model. 1993. V. 5. No. 8. P. 108. Al'tshuler L. V., Bakanova A. A., Trunin R. F. //JETP. 1962. V. 42. P. 91. Lange W. et al. //Z. phys. Chem. 1959. Bd 212. S. 238. Zinovyev V. E. 1989. Teplofizicheskie svojstva metallov pri vysokikh temperaturakh [Thermophysical properties of metals at high temperatures] [Russian]. 384 p.
	Zharkov V. N., Kalinin V. A. 1971. Equations of State for Solids at High Pressures and Temperatures (Engl. Transl.). New York. Ed. Consultants Bureau. Martynyuk M. M. 1999. Fazovye perekhody pri impul'snom nagreve [Phase transitions during pulsed heating] [Russian]. Moscow. Ed RUDN. 332 p.
	Korsunsky M. M. //JETP. 1985. V. 89. No 3(9). P. 875. Gathers G. R. //Rep. Prog. Phys. 1986. V. 49. P.
	Kozhevnikov V., Arnold D., Grodzinskii E., Naurzakov S. //J. Non-Cryst. Solids. 1996. V. 205–207. P. 256. Goetzlaff W., Schoenherr G., Hensel F. //Z. Phys. Chem. 1988. Bd. 156. No 1. S. 219. Gerasimov Ya. I., Krestovnikov A. N., Gorbov S. I. 1973. Khimicheskaya termodynamika v zvetnoj metallurgii [Chemical thermodynamics in non-ferrous metallurgy] [Russian]. V. 5. Moscow. Ed. Metallurgija. 296 p.
	Vukalovich M. P., Ivanov A. I., Fokin L. R., Yakovlev A. T. 1971. Teplofizicheskije svojstva rtuti [Thermophysical properties of mercury] [Russian]. Moscow. Ed. Standards. 312 p.
	Ayrinhac S., Gauthier M., Bove L. E., et al. //J. Chem. Phys. 2014. V. 140. P. 244201 (11). Hensel F. //Mat. Res. Soc. Proc. 1984. V. 22. P. 3. Levin M., Schmutzler R. W. //J. Non-Cryst. Solids. 1984. V. 61–62. P. 83. Filippov S. I., Kazakov N. B., Pronin L. A. //Izv. vysshikh uchebnykh zavedenij. [Izv. institutions of higher education.] Chernaya metallurgija. 1966. No. 3. P. 8 [Russian]. Tamura K., Inui V., Nakaso I. et al. //J. Phys. : Condens. Matter. 1998. V. 10. P. 11405. Data on the website http://www-mls.ias.hiroshima-u.ac.jp/~ tamura02/index.html. Kresse G., Hafner J. //Phys. Rev. B. 1997. V. 55. No. 12. P. 7539. Kikoin K., Senchenkov A. P., Gel'man E. V., et al. //JETP. 1965. V. 49. P. 124. Yao M., Okada K., Aoki T., Endo H. //J. Non-Cryst. Solids. 1996. V. 205–207. Part 1. P. 274. Holman G. J. F., ten Seldam C. A. //J. Phys. Chem. Ref. Data. 1994. V. 23. No 5. P.807. Compendium of Shock Wave Data. 1977. Ed. van Thiel M. Livermore: Lawrence Livermore Laboratory. Report UCRL–50108. P. 124. LASL Shock Hugoniot Data. 1980. Ed. Marsh S. P. Berkeley: Univ. California Press. Data on the website http://www.ihed.ras.ru/rusbank/. Tatarinova L. I. 1983. Structura tverdykh amorfnykh i zhidikikh veshchestv [Structure of solid amorphous and liquid substances] [Russian]. Moscow. Ed. Science. 151 p.
	Waseda Y. 1980. The Structure of Non-Crystalline Materials. Liquids and Amorphous Solids. N. Y. Ed. McGraw-Hill, 325 p.
	Bosio L., Cortes R., Segaud C. //J. Chem. Phys. 1979. V. 71. P. 3595. Bafile U., Hochgesand K., Winter R., et al. //J. Non-Cryst. Solids. 1999. V. 250–252. Part 1. P. 35. Belashchenko D. K. //Crystallography Repts. 1998. V. 43. No 3. P. 400. Chekmarev D. S., Zhao M., Rice S. A. //Phys. Rev. E. 1999. V. 59. No 1. P. 479. McLaughlin I. L., Hoshino K., Leung H. C., et al. //Z. Phys. Chemie Neue Folge. 1988. Bd. 156. S. 457. Munejiri Sh., Shimojo F., Hoshino K. //J. Phys. : Condens. Matter. 1998. No 10. P. 4963. Jank W., Hafner J. //Phys. Rev. B. 1990. V.42. No 11. P. 6926. Moriarty J. A. //Phys. Lett. A. 1988. V.131. No 1. P. 41. Sumi T., Miyoshi E., Sakai Y., Matsuoka O. //Phys. Rev. B. 1998. V.57. No. 2. P. 914. Sumi T., Miyoshi E., Tanaka K. //Phys. Rev. B. 1999. V.59. No 9. P. 6153. Belashchenko D. K. //High Temp. 2002. V. 40. No 2. P. 240. Belashchenko D. K. //High Temp. 2006. V. 44. No 5. P. 682. Belashchenko D. K. //High Temp. 2013. V. 51. No 1. P. 47. Belashchenko D. K. Erratum //High Temp. 2013, V. 51. No 6. P. 878. Hoffman R. E. //J. Chem. Phys. 1952. V. 20. No 10. P. 1567. Belashchenko D. K. //Russ. J. Phys. Chem. 2017. V. 91. No 8. P. 1388. Fokin L. R., Popov V. N. //High Temp. 2013. V. 51. No 4. P. 520. Klement W., Jayaraman A., Kennedy G. C. //Phys. Rev. 1963. V. 131. P. 1. Steenbergen K. G., Pahl E., Schwerdtfeger P. //J. Phys. Chem. Lett. 2017. V. 8. P. 1407. Belashchenko D. K., Vorotyagin A. V., Gelchinsky B. R. //High Temp. 2011. V. 49. No 5. P. 676. Gerasimov Ya. I., Krestovnikov A. N., Shakhov A. S. 1966. Khimicheskaya termodynamika v zvetnoj metallurgii [Chemical thermodynamics in non-ferrous metallurgy] [Russian]. V. 4. Moscow. Ed. Metallurgija. 428 p.	Thermodynamic Properties of Individual Substances. Fourth Edition. 1994. V. 3. Part 2. Ed. Gurvich L. V., Veyts I. V., Alcock C. B. CRC Press and Begell House. 448 p.
	Cox J. D., Wagman D. D., Medvedev V. A. 1989. CODATA Key Values for Thermodynamics. Hemisphere Publishing Corp., New York, USA. Assael M. J., Kakosimos K., Banish R. M., et al. //J. Phys. Chem. Ref. Data. 2006. V. 35. No. 1. P. 286. Boehler R., Ross M. //Earth Planet. Sci. Lett. 1997. V.153. P. 223. Hänström A., Lazor P. //J. Alloys Compd. 2000. V. 305. P. 209. Bhatt N. K., Thakore B. Y., Vyas P. R., Jani A. R. //Int. J. Thermophys. 2010. V. 31. P. 2159. Al'tshuler L. V., Kormer S. B., Bakanova A. A. Trunin R. F. //JETP. 1960. V. 38. No 3. P. 790. Van Thiel M. Compendium of Shock Wave Data //Lawrence Livermore Lab. Rep. 1977. V. UCRL 50108. P. 87. Trunin R. F., Belyakova M. Yu., Zhernokletov M. V., Sutulov Yu. N. //Izv. Academy of Sciences of the USSR. Physics of Earth. 1991. V. 2. P. 99. Zhugin Yu. N., Krupnikov K. K., Ovechkin N. A., et al. //Physics of Earth. 1994. V. 10. P. 16. Waseda Y. 1980. The Structure of Non-Crystalline Materials. Liquids and Amorphous Solids. N. Y. McGraw-Hill. 325 p.
	Mauro N. A., Bendert J. C., Vogt A. J., et al. //J. Chem. Phys. 2011. V. 135. 044502. Stallard J. M., Davis C. M. //Phys. Rev. A 1973. V. 8. P. 368. Dahlborg U., Kramer M. J., Besser M., et al. //J. Non-Cryst. Solids. 2013. V. 361. P. 63. Stadler R., Alfe D., Kresse G., et al. //J. Non-Crystalline Solids. 1999. V. 250–252. P. 82. Alfe D., Gillan M. J. //Phys. Rev. Lett. 1998. V. 81. P. 5161. Jakse N., Pasturel A. //Sci. Reps. 2013. 03135. El Mendoub E. B., Albaki R., Charpentier I., et al. //J. Non-Crystalline Solids. 2007. V. 353. P. 3475. Voter A. F., Chen S. P. //In: High temperature ordered intermetallic alloys, edited by R. W. Siegel, J. R. Weertman, and R. Sundan. MRS Symposia Proceedings No. 82. Materials Research Society, Pittsburgh. 1987. P. 175. Oh D. J., Johnson R. A. //J. Mater. Res. 1988. V. 3. P. 471. Cai J., Ye Y. Y. //Phys. Rev. B. 1996. V. 54. No 12. P. 8398. Rohrer C. L. //Modell. Simul. Mater. Sci. Eng. 1994. V. 2. P. 119. Mishin Y., Farkas D., Mehl M. J., Papaconstantopoulos D. A. //Phys. Rev. B. 1999. V. 59. No 5. P. 3393. Morozov I. V. //Comp. Phys. Communications. 2011. V. 182. P. 1974. Ercolessi F., Adams J. B. //Europhys. Lett. 1994. V. 26. P. 583. Liu X. Y., Ercolessi F., Adams J. B. //Modell. Simul. Mater. Sci. Eng. 2004. V. 12. P. 665. Demmel F., Fraile A., Szubrin D., et al. //J. Phys. : Condens. Matter. 2015. V. 27. 455102 (6). Landa A., Wynblatt P., Siegel D. J., et al. //Acta mater. 2000. V. 48. P. 1753. Morris J. R., Mendelev M. I., Srolovitz D. J. //J. Non-Crystalline Solids. 2007. V. 353. P. 3565. Mei J., Davenport J. W. //Phys. Rev. B. 1992. V. 46. P. 21. Mendelev M. I., Srolovitz D. J., Ackland G. J. et al. //J. Mater. Res. 2005. V. 20. P. 208. Apostol F., Mishin Y. //Phys. Rev. B. 2010. V. 82. 144115. Kargl F., Weis H., Unruh T., Meyer A. //J. Physics: Conference Series. 2012. V. 340. 012077 (5). Cherne F. J., Deymier P. A. //Scripta Materialia. 2001. V. 45. P. 985. Shaner J. W., Brown J. M., McQueen R. G. 1984 High Pressure in Science and Technology. Ed. C. Homan, R. K. MacCrone, E. Whalley (Amsterdam: North-Holland). P. 137. Fortov V. E., Dremin A. N., Leont'ev A. A. //High Temp. 1975. V. 13. P. 984. Belashchenko D. K. //Russ. J. Phys. Chem. 2012. V. 86. No 5. P. 758. Ayrinhac S., Gauthier M., Le Marchand G., et al. //J. Phys. : Condens. Matter. 2015. V. 27. 275103 (8). Thermodynamic Properties of Individual Substances. Fourth Edition. 1994. V. 3. Part 2. Ed. Gurvich L. V., Veyts I. V., Alcock C. B. CRC Press and Begell House. 448 p.
	Data on the website: http://www.ihed.ras.ru/rusbank/. Assael M. J., Armyra I. J., Brillo J., et al. //J. Phys. Chem. Ref. Data. 2012. V. 41. No 3. 033101 (16). Bykova N. A., Shevchenko V. G. //In “Fiziko-khimicheskie issledovanija zhidkikh metallov i splavov” [Physicochemical studies of liquid metals and alloys] [Russian]. Sverdlovsk. 1974. Ed. “The Ural worker.” P. 42. Filippov S. I., Kazakov N. B., Pronin L. A. //Izv. vuzov. Chernaja metallurgija. 1966. No 3. P. 8 [Russian]. Waseda Y. 1980. The Structure of Non-crystalline Materials. Liquids and Amorphous Solids. McGraw-Hill, N. Y. 325 p.
	Narten A. H. //J. Chem. Phys. 1972. V. 56. P. 1185. Bellissent-Funel M. C., Chieux P., Levesque D., Weis J. J. //Phys. Rev. A. 1989. V. 39. P. 6310. Belashchenko D. K., Ostrovsky O. I. //Russ. J. Phys. Chem. A. 2006. V.80. No 4. P. 509. Baskes M. I., Chen S. P., Cherne F. J. //Phys. Rev. B. 2002. V. 66. 104107. Schommers W. //Phys. Rev. A. 1983. V. 28. P. 3599. Belashchenko D. K, Ginzburg A. S. //Russ. J. Phys. Chem. A. 2001. V. 75. P. 790. Belashchenko D. K. //High Temp. 2017. V. 55. No 1. P. 47. Al'tshuler L. V., Bakanova A. A., Dudoladov A. P., et al. //J. Appl. Mech. Techn. Phys. 1981. V. 22. P. 145. Petit J., Nachtrieb N. H. //J. Chem. Phys. 1956. V. 24. P. 1027. Lyapin A. G., Gromnitskaya E. L., Yagafarov O. F. et al. //JETP. 2008. V. 107. No 5. P. 818. Chtchelkatchev N. M., Klumov B. A., Ryltsev R. E., et al. //JETP Letters. 2016. V. 103. No 6. P. 390. Comez L., Di Cicco A., Itié J. P., Polian A. //Phys. Rev. B. 2001. V. 65. 014114. Assael M. J. Kalyva A. E, Antoniadis K. D. et al. //J. Phys. Chem. Ref. Data. 2010. V. 39. No. 3. 033105(8). Kirshenbaum D., Cahill J. A. //Trans. ASM. 1962. V. 55. P. 845. Gerasimov Ya. I., Krestovnikov A. N., Shakhov A. S. 1961. Khimicheskaya termodynamika v zvetnoj metallurgii [Chemical thermodynamics in non-ferrous metallurgy] [Russian]. V. 2. Moscow. Ed. Metallurgija. 262 p.
	Filippov S. I., Kazakov N. B., Pronin L. A. //Izv. vuzov. Chernaya metallurgiya [Izv. universities. Ferrous metallurgy] [Russian]. 1966. No 3. P. 8. Tatarinova L. I. 1983. Struktura tverdykh amorfnych i zhidkich veshchestv [Structure of solid amorphous and liquid substances][Russian]. Moscow. Ed. Science. 151 p.
	Waseda Y. 1980. The Structure of Non-crystalline Materials. Liquids and Amorphous Solids (N.Y: McGraw-Hill). Mikhajlova L. E., Khristenko T. M., Il'inskij A. G., Romanova A. V. //Preprint Inst. Metal Phys. 30.87. (Kiev, Inst Metal Phys. AS UkrSSR, 1987). Itami T., Munejiri S., Masaki T., et al. //Phys. Rev. B. 2003. V. 67. 064201. Takeda S., Tamaki S., Waseda Y. //J. Phys. Soc. Japan. 1984. V.53. P. 3447. Tsuji K., Hattori T., Mori T., et al. //J. Phys. : Condens. Matter. 2004. V. 16. P. S989. Mendelev M. I., Belashchenko D. K. //Inorganic. Materials. 1994. T. 30. No. 11. P. 1412 (in Russian). Belashchenko D. K. //Russ. J. Phys. Chem. 2001. V. 75. P.
	Frohberg G, Kraatz K. H, Wever H. //In Proc. of the 5th Eur. Symp. on Material Sciences under Microgravity. Schloss Elmau. 5–7 Nov. 79S4 (ESA SP–222). P. 201. Belashchenko D. K., Polyanskii R. A., Pavlov R. N. //Russ. J. Phys. Chem. 2002. V. 76. No 3. P. 454. Belashchenko D. K. Computer simulation of liquid metals //Physics–Uspekhi. 2013. V. 56. No 12. P. 1176. Chapman T. W. //Mater. Sci. Eng. 1966. V. 1. P. 65. Assael M. J., Kalyva A. E., Antoniadis K. D., et al. //High Temperatures–High Pressures. 2012. V. 41. P. 161. Filippov S. I., Kazakov N. B., Pronin L. A. //Izv. Vuzov. Chernaya metallurgiya. [Izv. High schools. Ferrous metallurgy.] 1966. No. 3. P. 8 (Russian). Partouche-Sebban D., Pélissier J. L., Abeyta F. G. et al. //J. Applied Phys. 2005. V. 97. 043521 (11). Waseda Y. 1980. The Structure of Non-Crystalline Materials: Liquids and Amorphous Solids (McGraw-Hill, New York). Sauerwald F., Teske W. //Z. Anorg. Allg. Chem. 1933. B. 210. S. 247. Kruh R. F. //Chem. Rev. 1962. V. 62. P. 319. Dutchak Ya. I., Mikolaichuk A. G., Klym N. G. //Fiz. Met. Metalloved. 1962. V. 14. P. 548 [Russian]. Kaplov R., Strong S. L., Averbach B. L. //Phys. Rev. Sect. A. 1965. V. 138. P. A1336. Tatarinova L. I. 1983. Structure of Amorphous Solids and Liquids. Nauka, Moscow. [Russian]. Mendelev M. I., Belashchenko D. K. //Inorg. Mater. 1994, V. 30. No. 11. P. l412. Belashchenko D. K. //Russ. J. Phys. Chem. 2008. V. 82. No 7. P. 1138. Landa A., Wynblatt P., Siegel D. J. et al. //Acta Mater. 2000. V. 48. P. 1753. Belashchenko D. K. //Russ. J. Phys. Chem. 2012. V. 86. No 5. P. 779. Zhou X. W., Wadley H. N. G., Johnson R. A., et al. //Acta materialia. 2001. V. 49. No 19. P. 4005. Fraile A., Cuesta-Lupez S., Iglesias R., et al. //J. Nuclear Materials. 2013. V. 440. P. 98. Belashchenko D. K. //High Temp. 2017. V.55. No 3. P. 370. Marsh S. P. (Ed.). LASL Shock Hugoniot Data. Univ. California Press, Berkeley, 1980. Al'tshuler L. V., Chekin B. S. //In “Doklady 1-go Vsesojuznogo simpoziuma po impul'snym davleniyam” [Reports of the 1st All-Union Symposium on Impulse Pressures "] (Russian). Moskva. VNIIFTRI. 1974. P. 5. Handbook on Lead-bismuth Eutectic Alloy and Lead Properties, Materials Compatibility, Thermal-hydraulics and Technologies. 2015 Edition. © OECD 2015. NEA. No. 7268. Döge G. //Z. Naturforsch. 1965. B. 20a. S. 634. Rothman S. J., Hall L. D. //J. Metals. 1956. V. 8. P. 199. Gathers G. R. 1986. Dynamic methods for investigating thermophysical properties of matter at very high temperatures and pressures //Rep. Prog. Phys. 1986. V.49. P. 341. Schulte O., Holzapfel W. B. //Phys. Rev. B. 1995. V. 52. No 17. 12636 (4). Al'tshuler L. V., Bushman A. V., Zhernokletov M. V., et al. //JETP. 1980. V. 78. P. 741. Data on the website: www.webelements.com. Handbook on Lead-bismuth Eutectic Alloy and Lead Properties, Materials Compatibility, Thermal-hydraulics and Technologies. 2015 Edition. © OECD 2015. NEA. No. 7268. Data on the website http://www.ihed.ras.ru/rusbank. Assael M. J., Kalyva A. E., Antoniadis K. D., et al. //High Temp.-High Press. V. 41. P. 161. Nűcker N. //Z. Angew. Phys. 1969. B. 27. No. 1. S. 33. Filippov S. I., Kazakov N. B., Pronin L. A. //Izv. Vuzov. Chernaya metallurgiya. 1966. No 3. P. 8 [Russian]. Greenberg Y., Yahel E., Caspi E. N., et al. //A Letters Exploring the Frontiers in Physics. 2009. V. 86. 36004(6). Zaiss W., Steeb S. //Physics and Chemistry of Liquids. 1976. V. 6. No 1. P. 1. Nomssi Nzali J., Hoyer W. //Z. Naturforsch. 2000. Bd 55a. S. 381. Knoll W., Lamparter P., Steeb S. //Z. Naturforsch. 1983. Bd 38a. S. 395–398. Belashchenko D. K., Ostrovsky O. I. //Russ. J. Phys. Chem. 2006. V. 80. No 4. P. 509. Yan M., Šob M., Luzzi D. E., et al. //Phys. Rev. B. 1993. V. 47. P. 5571. Romain J. P. //J. Appl. Phys. 1974. V. 45. No 1. P. 135. Glushak B. L., Zharkov A. P., Zhernokletov M. V., et al. //JETP. 1989. V.96. P. 1301. Belashchenko D. K. //High Temp. 2017. V. 55. No 3. P. 370. Dőge G. //Z. Naturforsch. 1965. Bd 20a. S. 634. Cahill J. A., Kirshenbaum A. D. //J. Inorg. Nuclear Chemistry. 1963. V. 25. No 5. P. 501. Martynyuk M. M. //Russ. J. Phys. Chem. 1984. V. 58. No 8. P. 1896. Partouche-Sebban D., Holtkamp D. B., Pélissier J. L. et al. //Shock Waves. 2002. V. 11. No 5. P. 385. Klement W. Jr, Jayaraman A., Kennedy G. C. //Phys. Rev. 1963. V. 131. P. 632. Iosilevskiy I., Gryaznov V. //J. Nuclear Mater. 2005. V. 344. P. 30. Shpilrain E. E., Fomin V. A., Kachalov V. V. //High. Temp. 1988. V. 26. No 5. P. 892. Thermodynamic Properties of Individual Substances. Fourth Edition. 1994. V. 4. Part 1–2. Ed. Gurvich L. V., Veyts I. V., Alcock C. B. CRC Press and Begell House. 448 p.
	Fokin L. R. //Voprosy atomnoj nauki i tekhniki VANT. Seria: Jaderno-reaktornye konstanty [Russian] (Problems of atomic science and technics. Seria: Nuclear-reactor constants). 2016. Issue 3. P. 24. Boivineau M., Arles l., Vermeulen J. M., Thevenin Th. //Phys. B. 1993. V. 190. No 1. P. 31. Yoo C. S., Akella J., Moriarty J. A. //Phys. Rev. B: Condens. Matter. 1993. V. 48. No 21. P. 15529. Yoo C. S., Cynn H., Söderlind P. //Phys. Rev. B. 1998. V. 57. No 17. P. 10359. Belashchenko D. K., Smirnova D. E., Ostrovski O. I. //High Temp. 2010. V. 48. No 3. P. 363. Smirnova D. E., Starikov S. V., Stegailov V. V. //J. Phys. : Condens. Matter. 2012. V. 24. 015702 (8). Shapiro A. B., Summers L. T., Eckels D. J., Sahai V. 1997. Modeling of Casting Microstructure and Defects //Report LLNL UCRL–ID–128519. Wittenberg L. J. //Plutonium 1975 and Other Actinides. Proc. 5th Int. Conf. on Plutonium and Other Actinides //Ed. Blank H., Linder R. Baden-Baden: North-Holland Publ., 1976. P. 71. Ofte D. //J. Nucl. Mater. 1967. V. 22. P. 28. Marsh S. P. (Ed.). 1980. LASL Shock Hugoniot Data, (Univ. California Press, Berkeley, 1980). Barroso D. E. G. Equation of State of Uranium and Plutonium //arXiv:1502.00497 [cond-mat.mtrl-sci]. Yanilkin A. V. //High Temperature, 2017, Vol. 55, No. 1, pp. 40–46. Jacobsen M. K., Velisavljevic N. //J. Applied Physics. 2016. V. 119. 165904. Rohr W. G., Wittenberg L. J. //J. Phys. Chem. 1970. V. 74. No 5. P. 1151. Saito T., Sakuma Y. //J. Japan Inst. Metals. 1967. V. 31. No 10. P. 1140. Chase M. W., Jr., NIST-JANAF. 1998. Thermochemical Tables, Fourth Edition //J. Phys. Chem. Ref. Data, Monograph 9, 1998, 1-1951. Desai P. D. //J. Phys. Chem. Ref. Data. 1986. V. 15. No 3. P. 967. Assael M. J., Kakosimos K., Banish R. M. et al. //J. Phys. Chem. Ref. Data. 2006. V. 35. No. 1. P. 285–300. Filippov S. I., Kazakov N. B., Pronin L. A. //Izv. Vuzov. Chernaya metallurgiya [Izv. High schools. Ferrous metallurgy] [Russian]. 1966. No 3. P. 8. Il’inskii A., Slyusarenko S., Slukhovskii O. et al. //Materials Science and Engineering A. 2002. V. 325. P. 98. Mendelev M. I., Han S., Srolovitz D. J. et al. //Phil. Mag. A. 2003. V. 83. P. 3977. Belashchenko D. K., Ostrovsky O. I. //Russ. J. Phys. Chem. 2011. V. 85. No 6. P. 967. Shen Guoyin, Prakapenka V. B., Rivers M. L., Sutton S. R. //Phys. Rev. Lett. 2004. V. 92. No 18. 185701 (4). Koči L., Belonoshko A. B., Ahuja R. //Phys. Rev. B. 2006. V. 73. No. 22. P. 224113. Koči L., Belonoshko A. B., Ahuja R. //Geophys. J. International. 2007. V. 168. No. 2. P. 890. Daw M. S., Baskes M. I. //Phys. Rev. B. 1984. V. 29. P. 6443. Daw M. S., Foiles S. M, Baskes M. I. //Mater. Sci. Reports. 1993. V. 9. P. 251. Belashchenko D. K., Kravchunovskaya N. E., Ostrovsky O. I. //Inorg. Materials. 2008. V. 44. No 3. P. 248. Belashchenko D. K., Kuskov O. L., Ostrovsky O. I. //Inorg. Materials. 2007. V. 43. No 9. P. 998. Belashchenko D. K. //Russ. J. Phys. Chem. 2006. V. 80. No 5. P. 758. Belashchenko D. K. //Russ. J. Phys. Chem. 2013. V. 87. No 4. P. 615. Lin Z., Zhigilei L. V., Celli V. //Phys. Rev. B. 2008. V. 77. P. 075133. Belonoshko A. B., Ahuja R., Johansson B. //Phys. Rev. Lett. 2000. V. 84. No 16. P. 3638. Dziewonski A. M., Anderson D. L. //Phys. Earth Planet. Inter. 1981. V. 25. P. 297. Al'tshuler L. V., Krupnikov K. K., Ledenev B. N. et al. //JETP. 1958. V. 34. P. 874 [Russian]. Skidmore I. C., Morris E. //Thermodynamics of Nuclear Materials. Vienna: IAEA. 1962. P. 173. McQueen R. G., Marsh S. P., Taylor J. W. et al. The equation of state of solids from shock wave studies //In: High-Velocity Impact Phenomena. Ed. R. Kinslow. N. Y. Academic Press. P. 293. Appendix on pp. 515–568 (1970). Al'tshuler L. V., Kalitkin N. N., Kuzmina L. V., Chekin B. S. //JETP. 1977. V. 72. No. 1. P. 317. LASL Shock Hugoniot Data //Ed. S. P. Marsh. Berkeley: Univ. California Press, 1979. 672 p.
	Trunin R. F., Podurets M. A., Popov L. V., et al. //JETP. 1992. V. 102. No 9. P. 1433. Al'tshuler L. V., Krupnikov K. K., Panov N. V., Trunin R. F. //Physics – Uspekhi. 1996. V. 39. No 5. P. 539. Brown J. M., Fritz J. N., Hixson R. S. //J. Appl. Phys. 2000. V. 88. No. 9. P. 5496. Trunin R. F., Podurets M. A., Popov L. V., et al. //JETP. 1993. V. 103. No 6. P. 2189.
	van Thiel M. (Ed.). 1977. Compendium of shock wave data //Livermore: Lawrence Livermore Laboratory. 1977. Report UCRL 50108. 323 p.
	Data on the website: //www.ihed.ras.ru/rusbank. Trunin R. F. //Physics – Uspekhi. 1994. V. 37. No 11. P. 1123. Trunin R. F., Zhernokletov M. V., Simakov G. V., et al. //Shock Compression of Condensed Matter – 1997, Prog. Am. Phys. Society Topical Group, Amherst, Massachusetts, July 27 – August 1, 83–86 (1998). Hemley R. J., Mao H. K. //Int. Geol. Rev. 2001. V. 43. P. 1. Al'tshuler L. V., Krupnikov K. K., Ledenev B. N., et al. //Soviet Physics JETP. 1958. V. 34 (7). No 4. P. 874 [Russian]. Anzellini S., Dewaele A., Mezouar M., et al. //Science. 2013. V. 340. No 6131. P. 464. Ahrens T. J., Holland K. G., Chen G. Q. //CP429. Shock Compression of Condensed Matter – 1977. Ed. Schmidt/Dandekar/Forbes. Amer. Inst. Phys. 1998. P. 133. Dubrovinsky L. S., Saxena S. K., Dubrovinskaia N. A., et al. //Am. Miner. Jeanloz R. //J. Geophys. Res. 1979. V. 84. P.
	Sha X., Cohen R. E. 2007. arXiv:0708.0183 [cond-mat.other]. Aitta A. //J. Stat. Mech. 2006. P12015 (16). Li J., Fei Y. //In: The Crust: Treatise on Geochemistry. Ed. R. L. Rudnick. Elsevier. 2006. 702 p. 1. Zhang Wen-Jin, Liu Zhi-Yong, Liu Zhong-Li, Cai Ling-Cang //Phys. Earth Planetary Interiors. 2015. V. 244. P. 69. Sola E., Alfè D. //Phys. Rev. Lett. 2009. V. 103. 078501. Maa Y., Somayazulu M., Shen G., et al. //Phys. Earth Planet. Interiors. 2004. V. 143–144. P. 455–467. Brown J. M., McQueen R. G. //J. Geophys. Res. : Solid Earth. 1986. V. 91. No B7. P. 7485. Alfè D., Kresse G., Gillan M. J. //Phys. Rev. B. 2000. V. 61. No 1. P. 132. Wasserman, E., Stixrude, L., Cohen R. E. //Phys. Rev. B. 1996. V. 53. P. 8296.
. //Phys. Rev. B. 2002. V. 65. No 16. P. 165118 (11). Ackland G. J., Mendelev M. I., Srolovitz D. J., et al. //J. Phys. Condens. Matter. 2004. V. 16. P. S2629. Anderson W. W., Ahrens T. J. //J. Geophys. Res. : Solid Earth. 1994. V. 99. P. 4273. Belashchenko D. K. //Geochemistry Int. 2014. V. 52. No 6. P. 456. Zharkov V. N., Kalinin V. A. 1971. Equations of State for Solids at High Pressures and Temperatures //New York: Consultants Bureau. Chen G. Q., Ahrens T. J. //High-Pressure Mater. Res. Ed. R. M. Wentzovich et al. 1998. V. 499. P. 41. Mat. Res. Symp. Proc. Warrendale, PA, 1998. Vočadlo L., de Wijs G. A., Kresse G. et al. //Faraday Discuss. 1997. V. 106. P. 205.
	de Wijs G. A., Kresse G., Vočadlo L., et al. //Nature (London). 1998. V. 392. P. 805. Brazhkin V. V., Lyapin A. G. //Physics – Uspekhi. 2000. V. 43. No 5. P. 493. Smylie D. E., Brazhkin V. V., Palmer A. //Physics – Uspekhi. 2009. V. 52. No 1. P. 79. Data on the website: www. webelements.com. Gamsjäger H., Bugajski J., Gajda T., et al. 2005. Chemical thermodynamics of Nickel. Nuclear Energy Agency Data Bank. Organisation for Economic Co-operation and Development Ed. V. 6. Chemical Thermodynamics, North Holland Elsevier Science Publishers B. V. Amsterdam. Desai P. D. //Int. J. Thermophysics. 1987. V. 8. No 6. P. 763. Mah A. D., Pankratz L. B. 1976. Contributions to the data of theoretical metallurgy. XVI. Thermodynamic properties of nickel and its inorganic compounds. Washington: Bureau of Mines. Bulletin 668. Chase M. W., Jr. 1951. NIST-JANAF Thermochemical Tables, Fourth Edition. J. Phys. Chem. Ref. Data, Monograph 9, 1998, 1-1951. Gerasimov Ya. I., Krestovnikov A. N., Shakhov A. S. 1966. Chemical thermodynamics in nonferrous metallurgy. T. 4. M.: Ed. Metallurgy. 427 pages [Russian]. Hixson R. S., Winkler M. A., Hodgdon M. L. //Phys. Rev. B. 1990. V. 42. No 10. P. 6485. Assael M. J., Kalyva A. E., Antoniadis K. D., et al. //High Temperatures-High Pressures. 2012. V. 41. P. 161. Filippov S. I., Kazakov N. B., Pronin L. A. //Izv. Vuzov. Chernaya metallurgiya [Russian]. 1966. No 3. P. 8. Waseda Y. 1980. The Structure of Non-Crystalline Materials: Liquids and Amorphous Solids (McGraw-Hill, New York,). Eder O. J., Kunsch B., Suda M., et al. //J. Phys. F: Metal Physics. 1979. V. 9. No 7. P. 1215. Belashchenko D. K., Magidson I. A. //Izv. Vuzov. Chernaya metallurgiya [Izv. High schools. Ferrous metallurgy] [Russian]. 1983. No. 3. P. 4. Mendelev M. I., Belashchenko D. K. //Metally [Russian]. 1995. No 3. P. 21. Landa A., Wynblatt P., Girshick A., et al. //Acta Mater. 1998. V. 46. No. 9. P. 3027. Vitek V., Ackland G. J., Cserti J. //Materials Research Society. Pittsburgh. 1991. V. 186. P. 237. Baskes M. I. //Mater. Chem. Phys. 1997. V. 50. P.
	Zhang Q., Lai W. S., Liu B. X. //J. Non-Crystalline Solids. 2000. V. 261. P. 137. Koči L., Bringa E. M., Ivanov D. S., et al. //Phys. Rev. B. 2006. V. 74. 012101. Lin Zh., Zhigilei L. V. //Phys. Rev. B. 2008. V. 77. 075133 (17). Marsh S. P. (Ed.). 1980. LASL Shock Hugoniot Data. Univ. California Press, Berkeley. Al'tshuler L. V., Bakanova A. A., Trunin R. F. //Sov. Phys. – JETP. 1962. V. 15. P. 65. Lazor P., Shen G., Saxena S. K. //Phys. Chem. Minerals. 1993. V. 20. No 2. P. 86. Lord O. T., Wood I. G., Dobson D. P., et al. //Earth and Planetary Science Letters. 2014. V. 408. P. 226. Pozzo M., Alfè D. //Phys. Rev. 2013. B 88. No 2. 024111. Errandonea D. //Phys. Rev. B. 2013. V. 87. 054108. Urlin V. D. //Soviet Physics JETP. 1966. V. 22. No 2. P. 341. Cherne F. J., Baskes M. I., Schwarz R. B. et al. //Modelling Simul. Mater. Sci. Eng. 2004. V. 12. 1063. Lazarev N. P., Bakai A. S., Abromeit C. //J. Non-Crystalline Solids. 2007. V. 353. P. 3332. Ryltsev R. E., Klumov B. A., Chtchelkatchev N. M., Shunyaev K. Yu. //J. Chem. Phys. 2016. V. 145. 034506. Min Yan, Šob M., Luzzi D. E., Vitek V., et al. //Phys. Rev. B. 1993. V. 47. No 10. P. 5571. Caro A., Turchi P. E. A., Caro M., Lopasso E. M. //J. Nuclear Materials. 2005. V. 336. P. 233. Wax J. F., Jakse N. //J. Non-Crystalline Solids. 2007. V. 353. P. 3535. Mendelev M. I., Srolovitz D. J. //Phys. Rev. B. 2002. V. 66. 014205. Valladares A. A., Díaz-Celaya J. A., Galván-Colín J., et al. New Approaches to the Computer Simulation of Amorphous Alloys: A Review //Materials. 2011. V. 4. P. 716. Bazhanova Z. G., Oganov A. R., Gianola O. //Physics–Uspekhi. 2012. T. 182. No. 5. P. 521. Jimbo I., Cramb A. W. //Met. Trans. B. 1993. V. 24B. P. 5. Kupriyanov A. A., Filippov S. I. //Izvestiya vysshikh uchebnykh zavedenij. 1968. No 9. P. 10. [Russian]. Hultgren R., Desai P. D. Hawkins D. T, et al. 1973. Selected Values of the Thermodynamic Properties of the Elements. Am. Soc. Metals. Metal Park, OH. Chipman J. //Met. Trans. 1972. V.2. P. 55. Elliott J. F., Gleiser M., Ramakrishna V. 1960–63. Thermochemistry for steelmaking. V. 2. Addison–Wesley Pub. Co.
	Gustafson P. //Scand. J. Metallurgy. 1985. V. 14. P. 259. Ostrovski O., Belashchenko D. K. //High Temperatures–High Pressures. 2013. V. 42. No 2. P. 137. Weber M., Steeb S. //Z. Naturforsch. 1978. Bd 33a. S. 799. Maier U., Steeb S. //Phys. Condens. Matter. 1973. V. 17. No 1. P. 11. Waseda Y., Tokuda M., Ohtani M. (Japan) //Tetsu-to-Hagane. 1975. V. 61. No 1.P. 54. Urakawa S., Kikegawa T. //Photon Factory Activity Report. 2012. No 30 (2013) Part B. 2011G652. Oganov A. R., Price G. D., Scandolo S. //Z. Kristallogr. 2005. V. 220. P. 531. Pan Sh., Feng Sh., Qiao J., et al. //J. Alloys and Compounds. 2015. V. 648. P. 178. Sobolev A., Mirzoev A. //J. Mol. Liquids. 2013. V. 179. P. 12. Bazhanova Z. G., Oganov A. R., Gianola O. //https://arXiv.org/pdf/1206.0467. Zhang Y., Yin Q. Z. //PNAS. 2012. V. 109. No. 48. P. 19579. Belashchenko D. K., Mirzoev A., Ostrovski O. //High Temp. Mater. Proc. 2011. V. 30. No 4. P. 297. Belashchenko D. K. //RJPC. 2006. V. 80. No 5. P. 758. Pronin L. A., Kazakov N. V., Filippov S. I. //Izvestiya Vuzov. Chernaya Metallurgiya Proceedings of Higher Educational Institutions. Ferrous metallurgy, 1964. No 5. P. 12 [Russian]. Lepinskikh B. M., Belousov A. A., Bakhvalov S. G. et al. 1995. Transportnye svojstva metallicheskikh i shlakovykh rasplavov [Transport properties of metal and slag melts] [Russian]. Moscow. Ed. Metallurgiya. Morgan D. W., Kitchener J. A. //Trans. Faraday Soc. 1954. V. 50. No 1. P. 51. Poirier J. P. 1991. Introduction to the Physics of the Earth’s Interior. Cambridge: Cambridge Univ. Press. Li J., Fei Y. Experimental Constraints on Core Composition. Treatise on Geochemistry. V. 2. Editor: Richard W. Carlson. Elsevier. 2003. P. 521. Hirose K., Labrosse S., Hernlund J. 2013. Composition and state of the core. Annu. Rev. Earth Planet. Sci. V. 41. P. 657. Huang H., Wu Sh., Hu X., et al. //Geophys. Res. Lett. 2013. V. 40. P. 687. Ahrens T. J. //J. Geophys. Res. 1979. V. 84. P. 985. Brown J. M., Ahrens T. J., Shampine D. L. //J. Geophys. Res. 1984. V. 89. P. 6041. Ahrens T. J., Jeanloz R. //J. Geophys. Res. 1987. V. 92. No B10. P. 363. Kennett B. L. N. Seismological Tables: AK135 //Research School of Earth Sciences. The Australian National University Canberra ACT 0200. Australia. 2005. Belashchenko D. K., Kuskov O. L. //Doklady Earth Sciences. 2015. V. 460. Part 1. P. 37. Belashchenko D. K., Kuskov O. L., Ostrovski O. I. //Inorg. Materials. 2007. V. 43. No 9. P. 998. Belashchenko D. K., Ostrovskii O. I. //RJPC A. 2011. V. 85. No. 6. P. 967. Kuskov O. L., Belashchenko D. K. //Solar System Research. 2016. V. 50. No 3. P. 165. Alfè D., Gillan M. J. //Phys. Rev. B. 1998. V. 58. No 13. P. 8248. Alfè D., Gillan M. J. //Phys. Rev. Lett. 1998. V. 81. No 23. P. 5161. Umemoto K., Hirose K., Imada S., et al. //Geophys. Res. Lett., 2014. V. 41, 6712. Brown J. M., Fritz J. N., Hixson R. S. //J. Appl. Phys. 2000. V. 88. P. 5496. Koći L., Belonoshko A. B., Ahuja R. //Phys. Rev. B. 2006. V. 73. P. 224113. Belonoshko A. B., Ahuja R., Johansson B. //Phys. Rev. Letters. 2000. V. 84. № 16. P. 3638. Koći L., Belonoshko A. B., Ahuja R. //Geophys. J. Int. 2007. V. 168. P. 890. Belashchenko D. K., Kravchunovskaya N. E., Ostrovski O. I. //Inorganic Materials. 2008. V. 44. No 3. P. 248. Kuskov O. L., Belashchenko D. K. //Phys. Earth Planet. Interiors. 2016. V. 258. P. 43. Garcia R. F., Gagnepain-Beyneix J., Chevrot S., Lognonné, P. //Phys. Earth Planet. Int. 2011. V. 188. P. 96. Weber R. C., Lin P., Garnero E. J., et al. //Science. 2011. V. 331. P. 309. Ruppersberg H., Egger H. //J. Chem. Phys. 1975. V.63. P. 4095. Ruppersberg H., Reiter H. //J. Phys. F. 1982. V. F12. No 7. P. 1311. Gan X., Xiao Sh., Deng H., et al. //Fusion Engineering and Design. 2014. V. 89. P. 2946. Becker W., Schwitzgebel G., Ruppersberg H. //Z. Metallkde. 1981. Bd 72. H 3. S. 186. Azad A. M., Sreedharan O. M. //Gov. of India. Dep. of Atomic Energy. 1985. IGCAR–75. Gaşior W., Moser Z. //J. Nuclear Materials. 2001. V. 294. No 1. P. 77. Ruppersberg H., Speicher W. //Z. Naturforsch. 1976. Bd 31. S. 47. Wang B., Xiao Sh., Gan X., et al. //Comput. Materials Science. 2014. V. 93. P. 74. Becker W. Dissertation. Saarbrücken 1979. Senda Y., Shimojo F., Hoshino K. //J. Phys. : Condens. Matter. 2000. V. 12. P. 6101. Fraile A., Cuesta-Lupez S., Caro A., et al. //J. Nuclear Materials. 2014. V. 448. P. 103. Belashchenko D. K. //Inorg. Mater. 2012. V. 48. No 1. P. 79. Zhou X. W. //Acta Mater. 2001. V. 49. P. 4005. Wangyu H., Bangwei Z., Xiaolin S., Baiyun H. //J. Mater. Sci. Technol. 1999. V. 15. No 4. P. 336. Li X., Samin A., Zhang J., et al. //J. Nuclear Materials. 2017. V. 484. P. 98. Yanilkin A. V. //High Temp. 2017. V. 55. No. 1. P. 40. Kuksin A. Yu., Starikov S. V., Smirnova D. E., Tseplyaev V. I. //J. Alloys & Compounds. 2016. V.658. P. 385. Landa A. Ab initio study of advanced metallic nuclear fuels for fast breeder reactors //AVS 62nd Int. Symp. San Jose. LLNL-ABS-679004. 2015. Kolotova L. N., Starikov S. V. //Phys. Metals and Metallography, 2016, Vol. 117, No. 5, pp. 487–493. Thien C. Duong, Hackenberg R. E., Landa A., et al. //CALPHAD. 2016. V. 55. P.219. Beeler B., Baskes M., Andersson D., et al. //J. Nuclear Materials. 2017. V. 495. P. 267. Vertman A. A., Samarin A. M. 1969. Properties of liquid iron. Moscow. Science Ed. 280 p.
	Belashchenko D. K., Lobanov E. A., Syrykh G. F. //Russ. J. Phys. Chem. 2005. V. 79. Suppl. 1. P. S135. Lobanov E. A., Belashchenko D. K. //Inorganic Materials. 2006. V. 42. No 6. P. 622. Zel'dovich Ya. B., Raizer Yu. P. 2002. Physics of Shock Waves and High-Temperature Hydrodynamic Phenomena (Dover Books on Physics). Ed. W. D. Hayes and R. F. Probstein. Gryaznov V. K., Fortov V. E., Zhernokletov M. V., et al. //Sov. Phys. JETP. 1998. V. 87. No 4. P. 678. Trunin R. F., Medvedev A. B., Funtikov A. I., et al. //Sov. Phys. JETP. 1989. V. 68. No 2. P. 356. Trunin R. F., Simakov G. V., Sutulov Yu. N., et al. //Sov. Phys. JETP. 1989. V. 69. No 3. P. 580. Landau L. D, Lifshitz E. M. 1959. Fluid Mechanics. (London: Pergamon Press, 1959). Belashchenko D. K. //High Temperature. 2017. V. 55. No. 1. P. 47. Marsh S. P. (Ed.) 1980. LASL Shock Hugoniot Data (Univ. California Press, Berkeley). Al'tshuler L. V., Kormer S. B., Brazhnik M. I., et al. //Sov. Phys. JETP. 1960. V. 11. No 4. P. 766. Kormer S. B., Funtikov A. I., Urlin V. D., Kolesnikova A. N. //Sov. Phys. JETP. 1962. V. 15. P. 477. Al'tshuler L. V., Chekin B. S. //In: Proc. 1st All-Union Pulsed Pressures Symposium. 1974. VNIIFTRI. Moscow. V. 1. P. 5 [in Russian]. McQueen R. G., Marsh S. P., Taylor J. W., et al. //In: High Velocity Impact Phenomena. Ed. R. Kinslow. New-York. Academic Press. 1970. P. 293. Trunin R. F., Gudarenko L. F., Zhernokletov M. V., Simakov G. V. 2001. Experimental data on shock compressibility and adiabatic expansion of condensed substances. RFNC. All-Russian Res. Inst. Experim. Physics. Sarov. [in Russian]	Glushak B. L. Zharkov A. P., Zhernokletov M. V., et al. //Sov. Phys. JETP. 1989. V. 69. No 4. P. 739. Trunin R. F., Simakov G. V. //Mat. Model. 1993. V. 5. No 8. P. 108 [in Russian]. Mansoori G. Ali. 2005. Principles of Nanotechnology. World Scientific Pub. Co., New York. Lakhno V. D. 2001. Clusters in physics, chemistry, biology. Moscow – Izhevsk. 256 p. [Russian]. Berry R. S., Smirnov B. M. //Physics–Uspekhi. 2005. V. 48. P. 345. Suzdalev I. P. 2006. Fiziko-himiya of nanoclusters, nanostructures and nanomaterials. Ed. Komkniga. Moscow. 592 p. [Russian]. Berry R. S., Smirnov B. M. //Physics–Uspekhi. 2009. V. 52. P.137. Makarov G. N. //Physics–Uspekhi. 2010. V. 53. No 2. P.
	Sdobnyakov N. Y., Sokolov D. N., Samsonov V. M., Komarov P. V. //Russian metallurgy. 2012. V. 2012. No 3. P. 209. Andreazza P., Pierron-Bohnes V., Tournus F., et al. //Surface Science Reports. 2015. V. 70. P. 188. 1963. Thermodynamics of Small Systems. New York: Benjamin. Part 1. 171 p.
	Hill T. L., Chamberlin R. V. //PNAS. 1998. V. 95. No 22. P. 12779. Rusanov A. I. 1996. Thermodynamics of Solid Surfaces. Surface science reports. Elsevier. Zhukhovitskii D. I. //JETP. 2002. V. 94. No 2. P. 336. Zhukhovitskii D. I. //Colloid Journal. 2003. V. 65. No 4. P. 440. Veitsman E. V. //J. Colloid Interface Sci. 2007. V. 308. P. 100. Samsonov V. M., Khashin V. A., Dronnikov V. V. //Colloid Journal. 2008. V. 70. No 6. P. 763. Samsonov V. M., Kharechkin S. S., Gafner S. L., et al. //Crystallography reports. 2009. V. 54. No 3. P. 526. Sokolov D. N., Komarov P. V., Sdobnyakov N. Yu. //In “Physical and chemical aspects of studying clusters, nanostructures and nano-materials.” Issue 1. Tver Univ. Tver. 2009. P. 106 [Russian]. Tovbin Yu. K. //Russ. J. Phys. Chem. 2015. V. 89. No 3. P. 547. Farges J., de Feraudy M. F., Raoult B., Torchet G. //J. Chem. Phys. 1986. V. 84. P. 3491. Honeycutt J. D., Andersen H. C. //J. Phys. Chem. 1987. V. 91. No 19. P. 4950. Zhao Sh., Wang Sh., Ye H. //J. Phys. Soc. Japan. 2001. V. 70. No 10. P. 2953. Chushak Ya. G., Bartell L. S. //J. Phys. Chem. B. 2001. V. 105. No 47. P. 11605. Van Hoof T., Hou M. //Phys. Rev. B. 2005. V. 72. 115434. Vo Van Hoang, Odagaki T. //Phys. Rev. B. 2008. V. 77. 125434. Vo Van Hoang //Nanotechnology. 2008. V. 19. 105706. Kuzmin V. I., Tytik D. L., Belashchenko D. K., Sirenko A. N. //Colloid Journal. 2008. V. 70. No. P. 284. Belashchenko D. K., Sirenko A. N., Tytik D. L. //Nanotechnologies in Russia. 2009. V. 4. No 9–10. P. 618. Wang Sh., Liang X. //Int. J. Thermophys. 2010. V. 31. P. 1935. Wu Z. M., Kong C. Y., Yu P. //Adv. Mater. Res. 2011. V. 268–270. P. 184. Sirenko A. N., Belashchenko D. K. //Inorg. Materials. 2012. V. 48. No 4. P. 332. Belashchenko D. K. //Russ. J. Phys. Chem. A. 2015. V. 89. No 3. P. 516. Myasnichenko V. S., Razavi M., Outokesh M., et al. //Letters on materials. 2016. V. 6. No 4.P. 266. Loukhovitski B. I., Sharipov A. S., Starik A. M. //Chemical Physics. 2017. V. 493. P. 61. Loukhovitski B. I., Sharipov A. S., Starik A. M. //J. Phys. Chem. A. 2015. V. 119. P. 1369. Mackay A. L. //Acta crystallogr. 1962. V. 19. P. 916. Teo B. K., Zhang H. Magic Numbers in Clusters //In: Metal Nanoparticles. Ed. Feldheim D. L. and Foss C. A. 2002. Marcel Dekker. Inc. P. 55. Medvedev N. N. 1994. A method of Voronoi–Delaunay in research of structure of non-crystalline packings. Novosibirsk Univ. Novosibirsk. 112 p. [Russian]. Doyama M., Kogure Y. //Computational Materials Science. 1999. V. 14. P. 80. Tolman R. S. //J. Chem. Phys. 1949. V. 17. P. 333. Techniques de l’Ingénieur. Traitê Constantes physico-chimiques. Constantes mécaniques et viscosité. Données caractéristiques sur les tensions superficielles et viscosités des fluids. [Engineer's techniques. Treatment Physico-chemical constants. Mechanical constants and viscosity. Characteristic data on the surface tensions and viscosities of fluids] K 476–2. Belashchenko D. K., Ostrovsky O. I. //Russ. J. Phys. Chem. 2004. V. 78. No 8. P. 1302. Qiao Zh., Yan L., Cao Zh., Xie Y. //J. Alloys and Compounds. 2001. V. 325. P. 180. Nizhenko V. I., Floka L. I. 1981. The surface tension of liquid metals and alloys. Ed. Metallurgy. 208 p. [Russian]. Alymov M. I., Shorshorov M. Kh. //Metally. 1999. No 2. P. 29. [Russian]. Buffet Ph., Borel J. P. //Phys. Rev. A. 1976. V. 13. No 6. P. 2287.